The Best Western Plus Aberdeen is ideally located in the center of Aberdeen. Come and experience our hotel near the major tourist attractions. Best price guaranteed and exclusive deals. Settle in for the evening and relax in our king suite room. The newly renovated Best Western Plus® Aberdeen is located adjacent to the Chehalis River in the quaint downtown area. Enjoy the convenience of staying in the largest city in Grays Harbor County and just a 20 mile scenic drive from Ocean Shores. 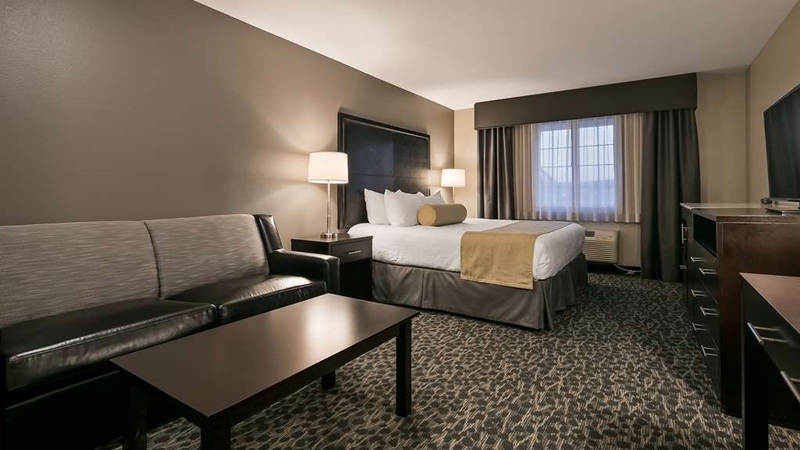 This Best Western has been recently renovated and the only hotel in town that has a pool and is serviced by either Seattle-Tacoma International Airport or Portland International Airport. Enjoy being within walking distance to the shopping mall and fast food restaurants. Clean rooms. Great Breakfast selections. Close to shopping and the water. Will stay again when we are in the area. Staff was very helpful and friendly. Got a great nights sleep and my animal allergies were respected. Thank you ! Nice hotel, Not much hotel wise in Aberdeen I recommend a odd numbered room they overlook the river. Rooms have microwaves and small refrigerators. My room was across from the elevator and it was very quiet. "Comfortable rooms and quiet environment"
Nice Hotel, friendly staff. Great for a stop over. Comfortable warm rooms. Free Hotel car park out the front, so easy access for luggage. Not a busy town in Feburary so parking in town was not a problem. Expect plenty of snow! I stayed just one night while in town for work. The hotel and room where clean and the staff was nice. 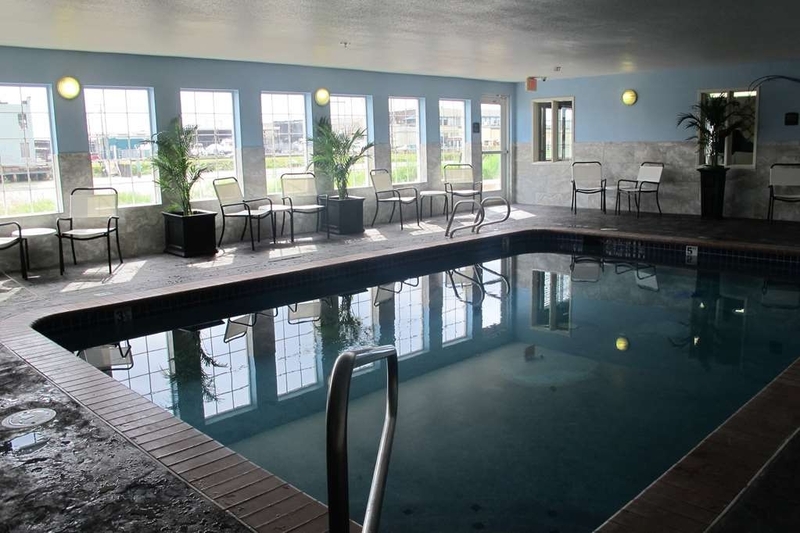 They have an indoor pool that is open until midnight and a fitness center. The hotel is right next to Walmart and close to lots of food options. My favorite part of my stay was the breakfast. They had the typical buffet style hotel breakfast with the classic eggs, bacon, potatoes, waffle maker, muffins, toast, cereal, fruit, etc. But the eggs, bacon, and potatoes at this hotel were much better than most places I've stayed. They were all hot and tasted great! The bacon was crispy and not the typical limp, soft bacon I have usually expect to see in hotels. Same with the potatoes. No soggy, lukewarm potatoes in this place. The breakfast was high quality. My only complaint is that the room did not have any channel guide for the TV. Nothing is more irritating than trying to find something to watch and having to flip channel by channel when you don't know the lineup. The Best Western Plus is a great place to stay while in Aberdeen. This is really the only place to stay in the general Aberdeen/Hoquiam area that you can count on pretty good consistency. I've had multiple stays related to both work and personal circumstances, and each time I've been satisfied. This trip, learning the property was pet-friendly was especially helpful. Even though we had the heat turned off in the room, it still gets oddly warm, especially for a first-floor room near an external door. In the middle of the night, we actually opened the windows to get some fresh air and cool things off. The staff were genuine enough to place a family with kids away from other guests, without even having to ask. They were super polite and friendly. Pets are allowed on the first floor, there is a hot tub, and the pool is heated as well. I really enjoyed my stay. Glad you enjoyed your stay and the amenity's we have to offer. Hope to see you again. Have a great day! We had points for a free night, so we made a quick trip down and this was an easy drive from the beach, and to home in the morning. Very clean, quiet and we had great stay. The pool and spa were clean. Glad we were able to stay with us using your Best Western points, and that your stay was enjoyable. Have a great day! I had no issues with my stay. The staff was friendly during check in and even at check out when I was leaving at 4 am. Not sure about the breakfast because I left way to early. The room and bathroom was very clean and plenty of outlets to charge devices. Th eroom had a very nice large TV with plenty of channels. Thank you for your review it is appreciated, hopefully you will be able to have breakfast with us on your next stay! Have a wonderful day! This is a new hotel located on the main drive heading out of the town towards Olympia. It's right on the river and has been decorated nicely. The price seems steep for this town, but if you look at other options, you don't mind paying a tad bit more. The coffee is good. The breakfast is nice with a lot of options. The pool and hot tub are well maintained. 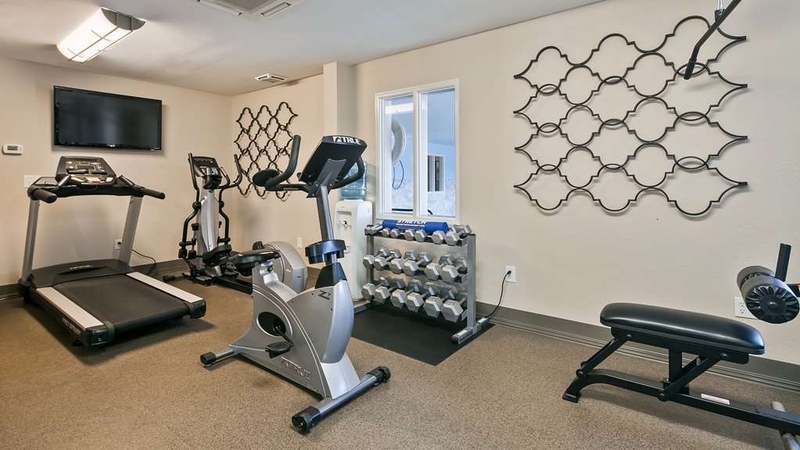 There's an exercise room. The hotel rooms are quite. Bathrooms are a little small but okay. Water pressure is a little low, but ok. Staff is friendly, helpful, and caring. Thank you for taking the time to give us some feed back it is appreciated, glad you enjoyed your stay. Hope to see you again on the harbor! Have a wonderful day! We generally try to stay at top luxury hotels when vacationing, but as a means of breaking up our drive from Seattle to Olympic National Park, we decided to spend one night in Aberdeen. As it had been many years since staying at a hotel/motel of Best Western's caliber, we weren't sure what to expect. We were pleasantly surprised. Our suite room was fresh, modern and spacious - absolutely no qualms there. Location wise, it's in a quite area away from the highway, so noise pollution was a non-factor. The breakfast spread was okay - the basics were covered (bread, eggs, fruit, bacon), and it did the job in filling us up prior to departing for Olympic. If all Best Westerns are of similar quality to the Aberdeen property, we might need to reset our expectations - we "settled" for Best Western, but we came away impressed with the experience. Thank you very much for your feedback and welcome to the BW family, glad your stay left a impression on you. Hope you enjoyed the Olympic National Park. Have a great day and hope to see you again on the harbor. Management cares for $$ than they do for safety of there guest. Cops called at 1200 for party across the hall. Group was finally escorted out at 3 am,, no sleep and had to get up for work at 7. Found out the same loud group was allowed back in the next morning and was told by front desk they were there until November,,, Two day into a four day stay we checked out within minutes. Please note this review does not apply to the staff on duty at the time, the night front desk person was a ROCK STAR on trying to get the group to quiet down. I apologize for the actions of others, once management was notified which was apparently after numerous complaints the front desk staff was instructed to call the police and have the guest removed, this situation was addressed with their company corporate headquarters and the appropriate employees were disciplined. This situation is not typical at our hotel and is not tolerated. Again I'm sorry that this situation cut your stay short with us. Have a wonderful day! A little too pricey for what you get. Newly purchased/remodeled BW motel. Staff was accommodating, but ran short in several areas. Breakfast was hit the worst. One of two waffle makers were dead each day. Ran out of several breakfast items on Sunday (an hour before breakfast closed), with no replacements. Breakfast area is too small, with overflow going into the lobby. Rooms and common areas clean. "Fabulous hotel with an outstanding breakfast buffet"
We were greeted by very helpful staff who advised there was security cameras in the parking lot which gave great peace of mind. Our room was perfect and everything was comfortable. The breakfast buffet was the best of our holiday! Thank you Helen appreciate your feed back and glad you had a good stay with us. Have a wonderful day! Our overall stay was great. The staff were friendly. Rooms tidy. Our only complaints were that the pet fees seemed high. The security of the parking lot was not great. The homeless were at the back door near the pet area. Upon entering and exiting they were there asking for money and blocking the doorways to get in and out. Also by our vehicle panhandling. "Super clean and well cared for." Facility shows a lot of pride and care. Super clean and will maintained. Nice location next to the river and a river walk. Dog friendly, although they charged $30. pet fee. That seemed rather high. Staff friendly and kind. Lots of variety for breakfast. Only con was not being able to walk very far on river walk due to a homeless encampment. Thank you for taking the time and giving us feed back we do appreciate it, have a great day! The room was okay, no real complaints. It is just the area is a nightmare to get in and out of, not only the town, but the hotel itself. Trying to pull out of the hotel lot I almost got broadsided. The town is a series of one-way streets which makes is difficult to go out to dinner or run to a grocery. It's unfortunate - the hotel itself was not bad, it's just nerve-racking to get to/from. Hi Paul, we do sympathize with your frustration makes it difficult in small towns with so much traffic and then one way in and one way out. Glad you enjoyed your stay other than the traffic issues. Have a great day! The room was very nice. Overlooked the river. The staff was very nice and helpful. Breakfast was better than most hotels. The only downside was the 530AM train whistle every morning. Obviously nothing the hotel could do about that. Kind of tricky to get to because of the one way streets and bridges. Thank you for taking the time to give us your feed back, hope to see you again on the harbor. Have a great day! This is your 'best' choice in Aberdeen/Hoquiam areas. Room was very clean and well updated. Unfortunately the smell from the logging industry cannot be curtailed. The smell permeates the rooms. All in all, I would say this is your best choice. Thank you Harold, a long history with a town built in the day on logging. Have a wonderful day and hope to see you again on the harbor! "Great place to stay when visiting both Westport and Ocean Shores"
I've stayed here a number of times, and it's my go-to place to stay when I'm birding in the Grays Harbor area (if I'm not camping). It's clean, comfortable, and quiet. (I do always wear earplugs, even at home. This time, we did notice a train go by once we were up.) It was nicely renovated in May 2016. As someone who is sensitive to fragrances, I appreciate that the linens and towels are fragrance free. (The toiletries are scented, but I always bring my own when I travel.) I tend to bring my own breakfast, but my travel companions have been happy with the breakfast selections. Thank you for taking the time to give us your feed back we appreciate it! Hope to see you again on your birding adventures, have a great day! "Nice large room and amenities"
We chose this Hotel because we had booked a less expensive place to stay that was not acceptable. We were very pleasantly surprised by the size and cleanliness of the room, and the facilities. The breakfast was exceptional and definately added to the value of the stay. The staff were pleasant and attentive. Thank you taking the time to give us your feed back on your stay, we appreciate it. Have a great day and hope to see you again! We stopped here while on a road trip through Washington and Oregon and we were pleasantly surprised staying here. The bed was very comfortable and the room was very clean. The complimentary breakfast was average at best, but it was a good value overall for one night. I'd stay here again if I was traveling through the area. Thanks Kevin, hope you had a good trip. Have a great day and hope to see you again on the harbor if your ever in the area! The location was the biggest issue I had. Trying to get out to go somewhere if it was even a little busy was awful. It was also located on a one way road, so if you needed to go the other direction you had to drive up and find a place to turn around at. Thank you for your feed back our little town is one way in and one way out so it can be a little challenging other than that glad you enjoyed your stay. Hope to see you again on the harbor. Have a wonderful day! "Great place to stay before a charter fishing trip!" We stayed at the Best Western Plus in Aberdeen for one night before heading to Wesport for a salmon charter fishing trip. Upon check in, the young woman asked us if we would like a sack breakfast to take on our fishing trip since we were leaving early the next morning. It was fantastic and so appreciated! She packed each of us a bagel with jam and peanut butter, bananas, granola bars, yogurt, and a bottle of water. The express check was also a breeze. We'll definitely be back!! Thank you look forward to having you as our guest again! Have a wonderful day. "Best place to stay in Aberdeen"
I stay at many Best Westerns. This one has everything down plus a great location. It's a short walk to great food, you can have a river view room and if you are lucky- you'll meet Courtney (she gets Best Western's most pleasant night clerk award) at check-in. Aberdeen is a good central Washington coast stop. Thanks for your feedback, I will pass along your kind words to Courtney she is a great asset to the hotel. Have a great day! No reason to stay here other than passing through. But, it looked like a newish hotel. Weird location (but I'm not sure there was any better location in that area). The customer in front of me was having some sort of issue with their stay (didn't hear details), but our one night stay was okay. All you can expect from a best western including free breakfast and wifi. Pool was good and not crowded. Staff was good. Quiet place to stay the night. Not much in this town but a good pit stop. Overall good place. Thanks Mike, have a wonderful day and hope to see you again on the harbor! "3 nights at the Best Western Plus Aberdeen provided a wonderful respite"
Our visit was wonderful. Courtney checked us in and gave us cheerful, encouraging words whenever we asked questions. She was so upbeat and positive, she made our visit extra special. Other staff members were also great in creating the environment we were looking for. The bed was one of the most comfortable possible giving us great rest. The breakfast included nearly everything on the menu you could ask for. My number one complaint here is how much I paid to stay a night in Aberdeen, Washington. Aberdeen. Washington. Not Aberdeen, South Dakota. That may make more sense. On a Tuesday. Yes, before Labor Day, but come on. I would never pay that much to stay here again. I might stay here again if the price was realistic, but it's not like there's anything this hotel has going for it except for being place to stay for a night. The internet is super, super slow. The parking lot is cramped. I didn't get shampoo for some reason (things happen, but it was a weird thing to miss). The room was remodeled fairly nicely and clean, so there was that. The shower was good, but you have to be 5'6" or shorter. The breakfast was actually not half-bad. Again, it's fine, but good god I'm not paying that much again to stay here. "NICE PEOPLE AND A NICE ENVIRONMENT"
Checked in at this morel with no reservation. Found we had arrived during kite festival season, and they were packed. But they did have an accessible king suite available that they would let us have. We took it and it was a very comfortable room, without a lot of the major accessibility apparatus one sometimes find. Staff was helpful and very cordial. Would stay again if in the area. Thank you for taking the time to give us a review, have a great day! Everything went very well with our stay here. Basically, that's it. You will not go wrong with staying here. The room was very nice. The breakfast was very good. The front desk employee was very helpful and quick. Thank you for your feed back we appreciate it, have a great day and hope to see you again! We booked last minute by calling in. Staff was friendly and the room vwry comfortable. Pool and hot tub were great after a long day in the car. Breakfast and location were great as well. No complaints from me. Glad we were here for you after a long day in the car, have a great day and hope to see you again if you are ever on the harbor! Great little place if you need to stay in Aberdeen. Rooms relatively newly renovated. Comfy couch. Free breakfast. Nice pool and decent gym open late hours. Nice walking path outside alone the river. Train noise is minimal due to double panes windows. WiFi could be better. But, I always stay here on my Aberdeen trips! We had a large, wonderful, spacious room. Becca was very helpful at the front desk. Breakfast from 6 am - 9 am was in a smallish area, but had complete and varied offerings. No issues or complaints and if in the area would stay again. Thanks for taking the time to review us, I will pass along your compliment to Becca. Have a great day! Stayed a night going down the coast. Easy parking. Friendly staff. Pool, hot tub. Clean room as expected. Cmplimentary breakfast nice though localities a bit cramped. Centrally located downtown near hwy. Thank you for taking the time to give us a review we appreciate it, have a great day and hope to see you again on the harbor! This was a great place to stay on our family trip through the Olympic Nat'l Park. There is an indoor pool which our kids enjoyed and a hot tub which our hike weary legs also appreciated. Nice spot to end our journey around the National Park before flying out of Seattle. About 2 hours of easy travel to the airport. The thoughtful staff made us to-go breakfast bags. Highly recommend the stop. Thanks for taking the time to give us such a great review glad we here to accommodate you and your family! Have a great day. I really enjoyed my stay here. The room is huge, the staff are delightful, funny, and helpful, the bed is suuuuuuuper comfortable, the free wifi works well, parking is free, and the hotel is very quiet. I don't see myself in Aberdeen again but if I am - without a doubt I'll be staying here. If you stay anywhere in Aberdeen, this is the place. Service at the front desk was fantastic, room was clean, and the bed comfort was amazing. Just wish I could have stayed longer. Location is near Walmart. Sometime a plus when traveling and you need to pick something up. Thank you for taking the time and giving us a great review, glad your stay with us was enjoyable. Hope to see you again on the harbor. Have a good day! Good Clean and above just Standard. We needed a place to stay and this was available at a good price. The room was standard. It was clean and the breakfast (hot) was included. I would stay here again. I have not stayed in a Best Western in a while. This one was very nice and I am glad we did. This was a nice clean hotel that was conveniently located by the majors freeway. The room was comfortable and spacious. Best of all it was affordable and they include internet and a decent breakfast buffet. "An outstanding place to stop & rest for the evening." After problems with several Best Western hotels I have not stayed in so many of late. However, this stay was a definite exception. We were pleasantly greeted by Courtney as she and her associated worked steadily trying to assist the influx of arriving guests. It was she who also recommended a great restaurant to us. The hotel and our room were both very clean. The fitness room was about the best I've encountered on a stay. We had a great night's sleep on a very comfortable mattress & pillows. The following morning our complimentary breakfast was simple but satisfying. We made use of the washer & dryer on this stay. About the only negative I saw was the single elevator for three floors, but I did need the exercise! Thanks for taking the time to review us Tim, I'm pleased to hear that my front desk staff took care of you and that you you had a good stay, these are the reviews that we strive for from our guest! Have a great day and hope to see you again in the future. We stopped here on our way to Opympia National Park for one night. This was the best mattress I have had on our two week trip. The bed had just the right weight comforter and I had a great nights rest. The breakfast was usual for Best Western and I would stay here again if in the area. Our room was quiet and clean. Based on your comments I'm thinking you meant to give us a higher score than 1 which is the lowest? Thank you for taking the time to review us, have a great rest of your trip! "we paint and no one cares"
Our room looked and smelled fine. We unpacked and settled in for the night. After an hour we noticed dark brown streaks all over our clothes and arms. What could it be? It was PAINT! Someone had "touched up" every piece of furniture in the room, and it was still wet. Desk, bureau, tv stand, night stands, and fridge cabinet. I showed the front desk clerk my trousers and she casually said, "oh...would you like to change rooms?" YES! No apology or explanation, but we were given another room.. Housekeeping came up while we were moving. She was more sympathetic and offered to wash the trousers I needed to continue our trip. We had to wait til morning to speak with a manager. In the AM, my trousers were waiting at the front desk. Of course the paint hadn't come out. The morning manager said she had to call the owner for compensation as each BW was individually owned (?) Ended up they credited $40. Not at all satisfactory to me. New trousers will be much more than that. 1) HUGE inconvenience. I am a light packer on a 2 week trip in the Olympic National Park. Shopping isnt on my itinerary 2) paint all over us. 3) no apology or sympathy. Just some vague comment about non communicating maintenance. This bad situation could have been smoothed over by a comped night. Even 50% would have been conciliatory. $40 is just insult to injury and another example of uncaring unempowered staff with an absent greedy owner. I do apologize again as I did numerous times while speaking with you, We all felt very bad and I did tell you that I would need to talk to the owner that I would charge your card and then talk to him that afternoon see what we could do for you as I find it better to address these things when not so busy, you asked me if I could compensate you immediately $30 or $40 dollars. I left the desk called the owner and he asked me what you wanted and I relayed your request. We did what you asked of us! I would be more then happy to pass on an additional 500 bonus points to your BW member # as we do care about our guest and strive to provide excellent service. "Nice hotel in busy area." Stayed here one night during our west coast trip. Had a King Executive Suite that faced the parking lot. I had requested a triver view, but got a parking lot view. Don't know if our type of room didn't face the river? The room was clean and spacious and one of the most comfortable beds in any hotel that we have stayed. The indoor pool was ver warm and the hot tub wasn't boiling like some hot tubs. The breakfast was decent, with two egg choices, sausage and potatoes. The young lady at check in was very pleasant each time we saw her. Welcome to the Best Western Family :) Hope to see you again on the harbor. Have a great day! I love this motel and always request a second floor room on the side facing the river. Beautiful to see the fog on the railroad bridge and old buildings along the river, plus hear the seagulls. Right by a Walmart and plenty of places to eat plus they have a great breakfast in the morning. Being on the 2nd floor you can sleep with the windows open and still feel safe. Parking lot is well lit and people are super friendly. This is the best motel on the Harbor. Thanks for your review, it is appreciated! Hope to see you again on the harbor. Have a great day! "GREAT Way to start the day"
Sheryl the CB manager is a great asset. She makes you want to have a good day, always friendly, happy, always ask what she can help with. Breakfast are always great ,with a smile and Have a great day as you leave. This is why I continue coming back. Thanks for the great review yes I agree Sherrell is a great asset to the hotel I will pass along your kind words I'm sure she will appreciate them. We will see you again on the harbor. Have a great day! "Best Business Hotel in Aberdeen"
Friendly staff. Good service and amenities. Not fancy but I think this is the best business hotel in Aberdeen. I have not tried the bed and breakfast of historic buildings. Was recommended to me by other traveling physicians as best option near Grays Harbor Community Hospital. Thanks for taking the time to review us, it is appreciated! Have a great day and hope to see you again on the harbor. "A very nice place with a wonderful staff." A great place to stay, very friendly and helpful staff. Very clean, newly remodeled and quiet except for the occasional train. Nice grounds, along the water. Plenty of parking and easy in - out access. Thanks for taking the time to review us, it is appreciated. Have a great day and hope to see you again on the harbor! Thanks for taking the time to review us, it is appreciated. Hope to see you again in the future. Have a great day! "Great place to stay when birding in Grays Harbor area"
Very nice, clean and comfortable rooms nicely located between Westport and Aberdeen. It's where I stay when I'm doing an overnight in the area and the weather is too dicey to camp (e.g., May). I've stayed here 3 times since they changed to Best Western Plus, and I've had a great experience each time. I stayed in a suite with a kitchenette once, and it was great for being able to cook some of my own food. Thanks Karen for taking the time to review us we appreciated it, glad we are here when you need us! We will see you again in the future. Have a great day! Wow! From the moment we arrived we were greeted with friendly faces and a spotless room! The dining area was comfortable and inviting with a great breakfast selection! We stayed here with our son's baseball team who were in town for a tournament. The pool was open until midnight, which was plenty enough time for the kids to swim. The rooms were spacious and quiet, which was a bonus! Definitely will stay here again when traveling through Aberdeen! Thanks for a great stay! "Lovely room on the railway but still quiet." This hotel was pretty much right on the railway line and trains did pass through but surprisingly the room was quiet. We didn't hear a train throughout the night and sleep was restful. Staff were very pleasant and check in was efficient and fast. We had a lovely room and it was quite spacious with comfortable beds and a lounge area which was nice for even more space. Bathroom was nice and the room and bathroom were very clean and updated. There was a guest laundry which we used and staff were quick to clean up a little mess that another guest had left so cleanliness is excellent at this hotel. I would definitely stay again if I was in the area. My wife and I travel with a group of senior citizens from our senior center. We stayed here on our recent trip to the area. The rooms were all very nice. The staff during check in and check out was very friendly and helpful. Breakfast in the morning was very good. The location is very convenient to Aberdeen, Westport or Ocean Shores. We will stay here again when we return to the area. Thanks for taking the time to review us, it is appreciated. Have a great day and hope to see you again! "Nice accommodations, pool and breakfast "
Never stayed here before but would highly recommend if you need a place to stay in the area. Kids liked pool and breakfast is included. Beds were comfortable and rooms were nice size. Location is a bit tricky to get to but actually in a fun spot to take a walk along the river. Thanks for taking the time to give us a review, we appreciate your business and hope that you & your family have the opportunity to stay with us again. Garmin could not find the address but desk person gave me perfect directions when I called. BW's are generally better than most comparable motels and this one certainly was as well. Great view of the river from our room. Good restaurants near by. Easy free parking. So glad you enjoyed your stay, have a great day and hope to see you again in the future. The hotel is located very close to a rail line, yet train noise was not a problem. It was ingenious and expensive for the owners to install two double-pane windows, making 4 layers of glass separated by 3 layers of air to dampen the noise. We heard the trains, but the sounds were low and non-intrusive. That is just one example of the care with which accommodations earn an attaboy. Other observations: I seldom sleep well in a strange bed and yet I got a restful night's sleep here. I like to read in bed and have to confess that the bedside light wasn't bright enough until I removed the shade. The bathroom was sparkling and I didn't hesitate to walk barefoot on the carpet. Very pleasant staff at check in. The room was very clean with a nice sitting area. Breakfast had many hot & cold choices. Walking distance to several unique restaurants along with some fast food chains. I see by your comments that they were all very positive but our score was a 1? Please let me know if there was a issue or something that we could of done better to make your stay more enjoyable. Have a great day and hope to see you again in the future. 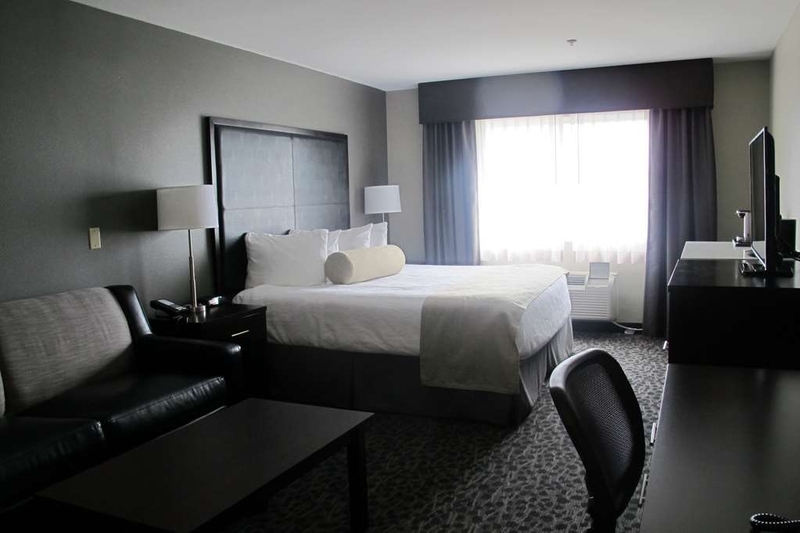 "Great value hotel in Aberdeen Washington"
Great value hotel in a nice location. The staff provided excellent service and were very knowledgeable about the area, they recommended places of interest in the areas we were travelling too. They also provided superior assistance with a concern I had with my credit card. A job well done. Thank you so much. 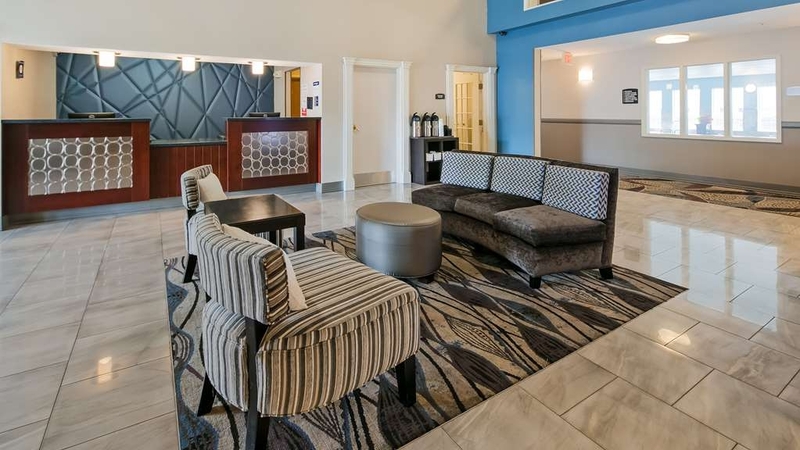 "Great choice for the Aberdeen area"
Modern hotel with large rooms, ample parking, easy main road access, good internet and breakfast, and wonderful front desk staff. Best hotel in the Aberdeen area. Will stay there every time I'm doing business in the area. 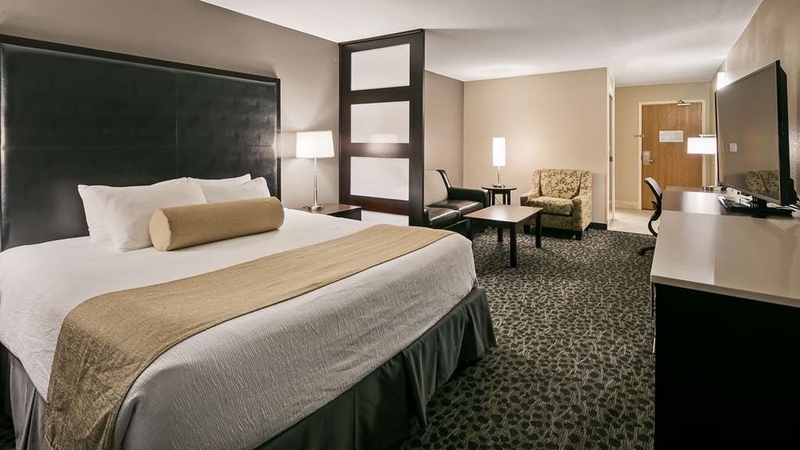 Nice hotel, clean, recently remodeled, big rooms, very comfortable, great staff, good fitness room & pool. Close to fast food & Walmart. Would like to see govt rate on the website and express checkout but those aren't critical. It's a nice hotel -- you won't do better in Aberdeen. We stayed one night after being at many Best Westerns on 2 week car trip. Pleasantly surprised at lack of noise. Comfortable bed and room bigger than we needed. Excellent breakfast. Easy to find at east end of town. A warm greeting by receptionist Courtney, who then booked our room, took care of all our requests & made us feel very welcome. Spacious comfortable room & a nice sofa area to relax. In-room coffee/tea and fridge. Surprisingly very quiet considering the locale, with intriguing view of waterways, road & rail! (Oh - in case you are concerned, no its not like 'My Cousin Vinny' with trains at unearthly hours! The train we saw crawled by so quietly - wouldn't have known it was there had we not looked out of the window). Just a few minutes walk to some shops & eateries - car not needed. Cannot advise what's in Aberdeen as we were touring from Portland up to Seattle, but very glad we stopped here. This is a perfect rest point to break a journey – easy access, easy parking, peaceful easy feeling…. recommended to revive those driving blues! The BW plus is really the only option to stay in the region, but they don't act like it. They earn my business each trip and I stay here weekly. The staff is extremely pleasant, the rooms nice, and breakfast area stocked and clean. Thanks for the great review, it is appreciated and I will share it will all the staff. Hope to see you agian! We were so glad to find this motel. Everything was perfect, comfortable and relaxing. We rented the family suite. Lots of room every thing we needed and more. Checked out early so did not get to try the breakfast. We had king room with comfortable bed with lights on both sides. Windows open onto nice river view. Room has a sofa; also a refrigerator and microwave. We were able to walk from hotel to Breakwater Restaurant for casual seafood. Hotel provided a good breakfast buffet. Overall a pleasant experience. Thanks for taking the time to review us, hope to see you again in the future when your passing thru. This hotel provided a good place to stay during a family visit last October. Staff was professional and friendly! We had the basic hotel breakfast the next morning and continued on our journeys. The room was clean and quiet. There wasn't much of a view but it was interesting to watch some of the barges going down the river. Make sure to go to Opal Art Glass in Cosmopolis and also drive out to Bennetts Fish Shack and take in the view from the tower. Thanks for your review, I agree Opal Art Glass is amazing and the view from the tower cant be beat. Have a great day and hope to see you again. My husband made reservations for one night stay before we did the 101 loop... we stayed in a king size room on the third floor. It was very very nice. The room was clean and well decorated. Appreciated the closet full length mirror. The tv was nice and large, we enjoyed laying in bed watching the Olympics. We had a nice view of the river, and got to witness snow the next morning. Breakfast was very nice and clean. I am gluten and dairy free, so it was nice to not only have almond milk option but some other options as well. Thank you. The only two down falls for us .. my husband is 6'4 and the shower head was a little short and then our bed although soft, had a dip in the middle. Other than that no complaints. Will stay here again for sure. Thanks for your review, it was a pleasure to have you at the hotel and am glad we had options for breakfast for you. I will look into the bed as our remodel is fairly new and our mattress should not be showing wear this soon. Have a great day and hope to see you again! Room was clean. We asked for extra shampoo and conditioner and received it with no questions asked. Breakfast was decent- selection of pastries, eggs, sausage/bacon/ breakfast ham, cereals and waffles. Pool was on the cold side, but the hot tub was just right. Staff were friendly. The motel was clean. I will stay here again. Thanks for the great review, hope to see you again in the near future. Have a great day! We stayed here for only 1 night as we were passing through and found it to be satisfactory. Our room was spacious and the bed was comfortable, but the cheaper poly-filled comforter on the bed was quite hot. There was also some varied noise to contend with here: 1) the floor above us was quite creaky, and 2) there was a weird vibration noise audible early in the morning - our room was right beside the exercise room so whether this noise was from someone using the exercise equipment very early in the morning is questionable. The breakfast is served in an open bright area adjacent to the hotel lobby. The food options served were varied and tasty. Thank you for your feed back, we appreciate it. Have a great day! "Nicest standard motel in Aberdeen"
Not that the bar is high, but this place has to be the nicest in town. Every year I stay at a cheaper place in town, but had some travel site credits, so I decided to treat myself. It is definitely a step up from the other, older properties. I had a clean spacious room view with a Wiskhah river view. I didn't sample the breakfast, but I'd assume typical BW fare. The only catch is the price - it can be a little dear compared to others in the area, and for the area in general, but one can think they are getting a little something for it, with modern facilities. I'd do it again if I felt like spending the money. Thanks for your review, we do honor several discounts just ask when you stay with us again and we would be happy to pass one onto you. Have a great day! Stayed here during Christmas while visiting family and I was happy with it. There are cheaper options around... but those are not nearly as nice. This was clean. Lots of parking. Friendly staff. I stayed in the suite that was street facing (no water view) but that didn't matter so much to me because I was gone during the day both days I stayed. The suite was spacious. Nice kitchen! Loved the ample room and could have easily had 5-6 people visit if I needed to. Hot tub and pool looked clean and ready for use (I didn't use them this time). I was not up early enough for breakfast so I can't speak on that. My only complaint... the train that goes by. It was honking loudly for what felt like 5 minutes on and off at roughly 5AM. That was tough to deal with. Nothing the hotel can do about that but something to point out. I enjoyed my stay and I will go back here again when I visit family. Look forward to seeing you again in the future, let us know at check in and we can try to offer you something somewhat in the middle, that may help with the train if you are sensitive to it. Have a great day! As we travel across the United States and most of the time are loyal Best Western customers, this particular motel was a disappointment. Not because of the room, it was clean, warm and really no complaints there but the check-in experience didn't go as we are used to. The gal that checked us in was not accommodating and really doesn't seem to either like her job or doesn't care or wasn't trained properly - not sure but we had to ask if they have gift bags for platinum members - should not have to do that!!! And when I asked if she could help us since we did not call ahead to use our points, she said 2 things that were wrong, she'd have to call the reservation # and they would be 24,000. The other Best Western's during this same trip, WERE able to help us AND only 10,000 per night AS our Email had read to us across the country. Guess she didn't get the memo! "cleanliness of the suit we stayed in wasn't good"
Truthfully, I left Aberdeen, WA in 1987 because it was a nothing/nowhere town with no signs of improvement in society or basic infrastructure. I go back now and find sings all over the place of this town rising from the ashes of a failed logging industry. This hotel was one of those signs. I completely recommend it. CLEAN! GOOD STAFF! AWESOME SWIMMING POOL AND JAKUZZI! The Breakwater restaurant is pretty good, too. Just a short walk over the bridge crossing the Wishkah River. When I went to get in bed it was clear the bed hadn't been changed. The sheets were very wrinkled from where the previous guest had laid. There were small black hairs all over the sheets. Yuk. I did not report it as I have slept in worse (lots of travel in third world countries). It was very late at night and I just wanted to sleep. I usually stay at Hilton products, but none were available in Aberdeen, so I stayed at the Best Western. It is best hotel in Aberdeen and the staff is very friendly and helpful. There is nice hot breakfast in the morning and the rooms are modern, clean and moderately priced. Our family had a great stay. The pool and rooms were nice and very comfortable beds. Very nice/large breakfast room and pleasant staff. We had two different stay of rooms and both had very comfortable beds. Nice property, clean, efficient for one night stay. Was in Aberdeen for one day of business and choose the Best Western because I had stay in one on a recent trip to WI. Was impressed with updated and was upgraded to King suite which is always nice to have extra room. I would recommend this hotel to any business travler. We loved staying in this hotel. Had great room right on the river and ocean and could hear the sea lions talking from our window. Food for breakfast was good, service friendly and the room very nice. Highly recommend! "decent but had one isolated housekeeping issue"
I will stay here again ... one of the better choices in the Aberdeen area. Good location, nice décor and furnishings, nice indoor pool and spa and above average typical breakfast. Front desk friendly and efficient. My only problem this stay was housekeeping forgot to restock my towels one day and never vacuumed my room even though some obvious dirt (cracker crumbs) was present and remained for three days. Probably just one apathetic housekeeper. Previous stays have had no problems. This hotel is in a good location for access on and off HWY 101. The hotel is clean and the staff is very nice when asking questions. I prefer to book hotels that are walking distance of food that isn't fast food and there is a great seafood place directly over the bridge "5 minute walk". I will use this hotel next time in town for sure. Nicely appointed modern hotel. Online, the BW Aberdeen seemed the best option in the area...and after driving around and seeing the other choices, I would choose the BW over the others in a heartbeat! Kids enjoyed the pool after our long drive to the area. I appreciated the included breakfast for the price. Standard breakfast items with addition of hot eggs, potatoes, sausage and the kids' fave: make your own waffle! All staff that we encountered were cheerful and friendly, accommodating our requests in a timely manner. We spent one night here and I would do so again if I needed to stay in this area. We booked a queen suite and while the room wasn't especially nice, it was spacious. The pool was out of service which wasn't a big inconvenience for us, but an apology would have been nice. The worst attribute was breakfast. There wasn't much variety, the quality was poor, and packaged yogurt was served beyond its expiration date. I might sleep here again, but I would go elsewhere for breakfast. "Best Western Plus, Aberdeeen, Washington"
Excellent accommodation. We were told this was the best motel in Aberdeen, Washington and we found this to be true. Very nice room, comfortable bed, quite, no noise. Located on an east bound one way street and very difficult to access from the east. "Tour of nw Washington state"
We enjoyed our one night stay. The hotel met our needs . It was close to church, meals and main highways, We thank you for good breakfast and acceptance of AARP card. We will stay there again if ever in the area. It appears this hotel has recently undergone an upgrade, and it appears all the money went to the lobby and not the rooms or staff. I somehow got what I think was supposed to be an accessible room, but I cannot fathom anyone in a wheelchair being able to use that room. There's a large coffee table blocking the love seat, and the bathroom has an ancient looking tub with crappy handheld shower head that is mounted high on the wall and has minimal reach. It also doesn't work well for someone standing in the shower as it won't stay center. My room was also next to the fitness center and everything vibrated when someone used the fitness center, to the point I had a lampshade fall off. The WiFi is barely better than dial-up with constant lags and need to reenter the access code. The room service is inconsistent. My trash wasn't always emptied and the products I used were not always refilled. The staff takes their smoke breaks just outside the front door, and I can't fathom a more obvious lack of professionalism. Overall the value for what was paid was not even remotely close. I haven't stayed at a Best Western in years, I am doubtful I'd ever try again, but I did think it would be a better experience. This hotel seemed to be newly remodeled. Room was clean and airy. We loved the comfortable beds and the view from our window. We were thankful that there was plenty of space in the parking lot, as we brought our enclosed cargo trailer with our Harley. We were able to ride over to the Washington coast on our Harley, what a great ride from Aberdeen. The only downside was there was a funny smell to the room. Staff was nice. We would stay here again!! "Brother, do you have some share change?" It seems that all of Aberdeen Washington has become one huge homeless camp. I have never been panhandled so many times in my entire life (including on the hotel property). To that end I am saying that the BW Aberdeen is way over priced for area that it is located. 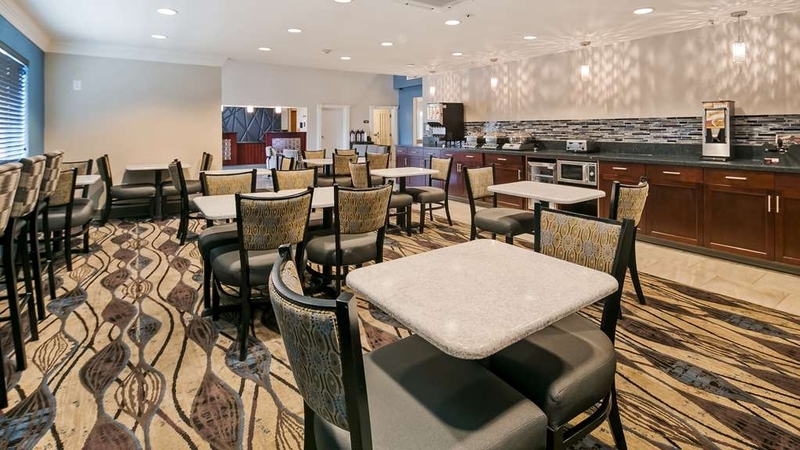 "Great location, and very clean"
I have stayed here many times when working in this area, the hotel is clean, has a nice continental breakfast and in a good location. The room is nice and the bed is comfortable. I will stay here whenever I am in the area. The property has been updated recently and appears very new and clean. At check in, the two ladies running the night shift were very friendly and went out of their ways to help with the stuffs we requested: cork opener, laundry detergents, and etc. we are late risers when we are vacation and usually don't leave the hotel till11:00 am. This was the excuse they used when I reported to them that our room was not cleaned when we came back from a day long outing in the Olympic national park. We have been traveling all over the world and that's second time it happened to us(all in the same trip, one in Oregon one in Washington state). I start to think it is a west coast thing. Other this incident, our stay was very decent. Heard the train went by a few times but it didn't bother us that much because the sound was somewhat muffled once the windows were closed. In addition, the trains didn't pass by during odd hours of the night. Aberdeen was the second stops of our trip. We had been eating hotel breakfasts at homewood suites for the previous 5 days b/4 Aberdeen. We were so sick of it and decided to bring in our food instead. We had a king suite that came with a full kitchen which enabled us to reheat the food we brought. We skipped breakfasts and even went out to Starbucks to get coffee the last two mornings we were there because the coffee at BW was really bad. For those foodies who plan to visit Olympic national park via Aberdeen, consider bring your own food and wine. Aberdeen is culinary desert. 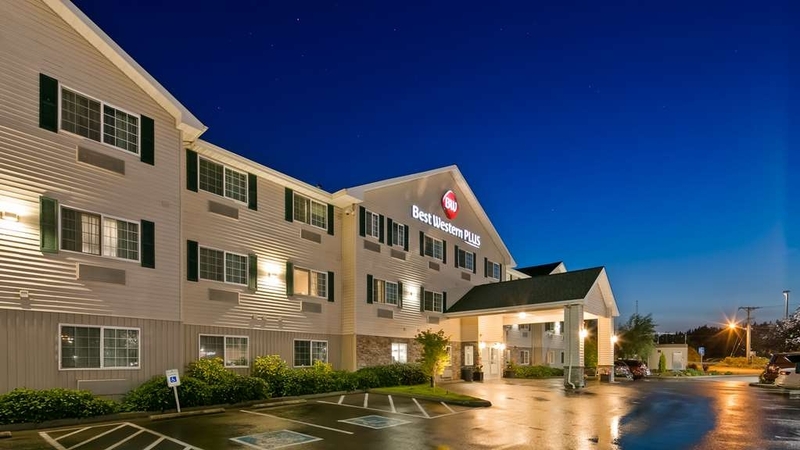 "Best Western Plus Aberdeen, Aberdeen,Washington"
Great , Friendly Service. Staff is very helpful and friendly. Guests privacy is respected by all Staff in the hotel. The breakfast was very good . I also felt safe staying at this hotel and shopping and other restaurants were close by. The room was fine, and the location is great. The hot tub was broken. Breakfast was the worst kind of fast-food stuff that I would not have in my home. Margarine blend, weak coffee. The staff spend a lot of time outside the front door smoking, so you get to walk through that. There is a case of water bottles in the lobby, with a sign saying that you are being photographed in case you try to take one without paying. Strange vibe on the hospitality front. Bizarre arrangement of bed pillows, perpendicular to the wall. What? This hotel was clean ,beds were most comfortable,quiet,everything worked,staff was great and the food was excellent.I would stay at this hotel again. It was most enjoyable.My only regret was that I only needed to stay one night. Staff unfriendly understaffed cleaning rooms after 3:00 pm check in. Housekeeping in the hallway means they are not employing enough staff. Breakfast staff was down right rude. Slow and argumentative to hotel guests. Pleasure staying here where property was updated and clean (bathroom toilet not so much-housekeeping needs to be more attentive here). Nice breakfast room space but layout could be improved. Suggest hard boiled eggs vs powdered egg scrambled. We appreciate your feedback and will definitely use it to provide better service to our future guests. Thank you. The chain again delivered what is expected: clean comfortable rooms for a good price. Amenities as expected. This isn't a 5 star place, but if what you are looking for is a place to regroup and recharge they fit the bill every time. We thank you for giving us an honest review. It is the best hotel in town, but nothing compare to other Best Western I had stayed. During my stay, 2 out of 3 nights, room not clean, bed not made, not fresh towel or toiletry. At the breakfast, fresh fruits almost none existed or a few old/sad banana, apple in the basket that I wouldn't care for. Coffee, milk, yogurt were always empty. Breakfast area is too small, always crowded. Just not a good set-up. Someone in town told me that homeless people is a huge problem for the bussiness. Really liking this chain - friendly staff, clean quiet rooms with fridge and microwave and excellent breakfast included. Definitely recommend this to travels or business people. Very happy with stay. There is a swimming pool and a hot tub if you are so inclined. Ended up in Aberdeen late.. Got this room last minute and glad we did. Newly updated suite. Very roomy and comfortable. Beds/pillows were better than most I've had traveling. Breakfast was well stocked and good. Regular full breakfast items . Decent coffee. Hot tub and smallish pool. Absolutely would stay here again. Room was clean and decor was nice. There was abundant parking. The bedding was very comfortable and the bathroom was spacious. Unfortunately, the sound insulation is very poor. You could hear every footsteps and bathroom activity in the room above. I could also hear every conversation in the lobby and at the front desk. The staff weren't friendly or efficient. This was a typical Best Western Plus. The room was large with all the necessary amenities. The bed was on the soft side. We took advantage of the laundry facilities. The personnel at the front desk were helpful. The breakfast was the typically BW heated up frozen food which was not very appetizing, the worst of our road trip breakfasts. "Great room and great service"
My husband was in the hospital for emergency and I was in need of hotel room for a good night's sleep. The service was great and the room was wonderful. Clean, comfortable, quiet and nicely decorated. I slept great that night and enjoyed their breakfast service in the morning. Everyone I met there was kind, helpful and efficient. I would definitely stay there again. And I recommend this hotel to others. It was an excellent experience. My room was stylish and decorated nicely. The bed was very comfortable. The breakfast was very good. The hotel was super clean and tidy. The staff was very friendly and courteous. I will stay there again. "Great location for ferry to Victoria"
A good property and a comfortable night sleep. Close to the Coho Ferry so if you are going to Victoria for the day, this is as good a place as any for before and after your day in Canada.Nice and clean-pillows smell freshly laundered-and the room is comfortable. I am somewhat confused by why all BW rooms seems to have low toilets and high beds. What are the decorators thinking? I'm an average height woman with 2 bad knees. For me this was a terrible combination! "Nice Hotel with mediocre surroundings"
Typical good Best Western room with a great breakfast included. Nice-sized room with adjoining additional TV and lounge room. 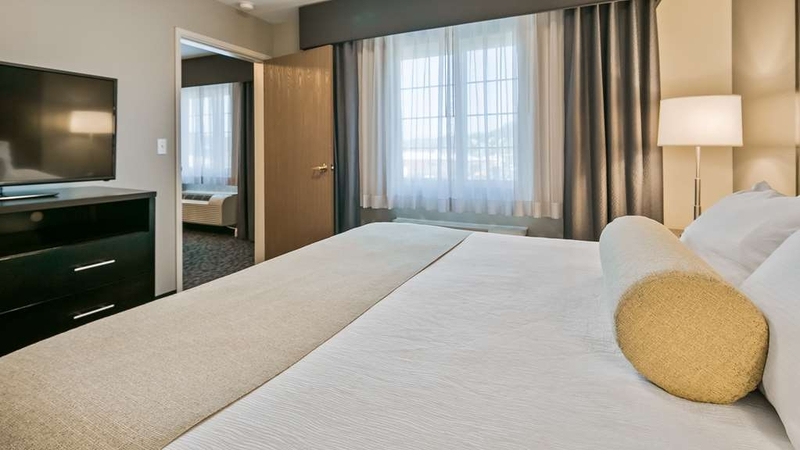 Clean and well-maintained room and hotel. Our king-size bed was very comfortable, and there were no complaints with any amenities. I stayed in this hotel as a stopover between Olympic National Park & Oregon. While Aberdeen itself doesn't seem to have all that much to see or do, this hotel was great! The room was spacious, the bed was comfortable & everything was very clean. The staff were very friendly and helpful. I wish I could've taken this hotel with me to the rest of the places I visited on my trip! If anywhere near this area - highly recommended! We normally do not stay at Best Western properties. However, maybe we will in the future. This room was quite large with a sofa, desk, king sized bed, lots of room for luggage, and a normal sized bathroom. The "view of the marina" wasn't so hot, interesting, but not very scenic. The staff was very pleasant and the bed was comfortable. The breakfast was very average. I would stay here again. Family of 4, stayed here for 1 night on the way to Olympic National Park. The room and beds were comfortable and clean. Breakfast was utilitarian. The stay was comfortable other than being woken up by a loud train horn early morning. Great remodel, quiet room with River view, nice linens & comfortable beds. Huge improvement over the previous hotel. Appreciate the complimentary breakfast. Like the location..easy access to highway , ocean beaches. & downtown. My wife and I enjoyed our stay immensely. The room was wonderful and was worth every penny. It was refreshing after a bad hotel experience the night before. We would stay at the Aberdeen BW again in a heartbeat. And the complimentary breakfast was delicious. The swimming pool was nice and comfortable. "If You Must Stay in Aberdeen"
1st-this is one of the nicer places in Aberdeen 2nd-avoid Aberdeen if you can 3rd-it cost more to stay in Aberdeen than Olympia or Tacoma It is on the 101 so if you have to stop 'I highly recommend this over other places in town. It is on the river, although it is not a very scenic rive rat this point. It is also close to downtown (or what passes for downtown). There is a Wal-Mart close to it. The choices of cuisine are somewhat limited in the town. The pool and hot tub are inside, so you can use them year round. The bed and pillows are very comfortable. The television was a bit on the small size. Great customer service and friendly staff with nice rooms. The cons were the trains that went by and lots of homeless in area but never had a problem. The breakfast wasnt the best either. Would go back though and also would recommend the hotel. "Great look- terrible service & breakfast"
I was quoted one price, I was sent an invoice for that price, I called and made a minor change, I was never told it would cost more, I was never sent another invoice. When I arrived I was charged more. When I brought it up to the manager he was incredibly rude and disrespectful and would not honor the price I was quoted and booked at. The difference was for only $20, which isn't a large amount, but I was very unimpressed by how I was treated and how this price difference was never communicated to me. This could be seen as a singular incident EXCEPT the SAME sort of thing happened to my brother. They tried charging him an extra 20 bucks for his room too! The room was really nice. I got upgraded to a king bed with Jacuzzi tub suite. It was amazing! The only problem is the location of the hotel. There were way too many homeless meandering around outside at night. Hotel was great, staff was friendly. Hotel was clean and tidy. Breakfast was great, nice selection to choose from. Room was comfortable, looked as thought they had been recently remodeled. bed was comfortable. We came and stayed for our anniversary, our stay was very pleasant. Very spacious and up-to-date room. Good breakfast. Comfortable king sized bed. Nicely decorated. We asked for extra pillows and they were promptly delivered. It was quiet and private. Bathroom was generously sized. Room was clean and comfortable. The spa involved the room was amazing. Breakfast was good and staff were friendly. There was hair clogging the drain in the shower and the wifi was spotty. Not worth complaining about though. Worth the money for that room! We will be back again. We stayed here on our way from Hoh Rainforest. The hotel appears to be newly renovated. Our room was very spacious and clean. All staff were very pleasant and helpful. The breakfast was great in the morning with a selection of hot foods including homemade waffles, and yogurt, cereal, pastries. Very satisfied with our experience and won't hesitate to stay with a Best Western chain hotel again. "Great Hotel, pity about the breakfast experience." Aberdeen itself is a bit past it's sell by date, but it was a convenient location for us to stay. Check in was fine with very chatty and knowledgeable staff who made so good recommendations for dinner. Did notice later that they were spending so much time checking in each customer that a queue (line) had built up! When we got to our room we were amazed at how large it was. 2 separate sitting areas, one in a completely separate room and a huge bedroom, quite outstanding and outside of booking a suite with multiple rooms this is the largest "standard" hotel room we have seen on this trip. The gloss was rather taken off the stay the next day by the breakfast experience. The breakfast room is far too small, needs to be doubled or trebled in size for the number of residents, many people seemed to be stocking up for the whole;e day rather than just having breakfast, so the food ran out frequently, and there were not enough staff to keep it stocked up. Apart from the breakfast experience this is a great place to stay. "Front desk staff are ill untrained, and incredibly unprofessional. Very poor representation of this chain." In short, we were mistakingly quoted Sundays price which was almost $100 less. The staff made us out to be scammers and made it sound like the price of 130 is never a price they offer. We found out the next morning the woman who booked us remembered the issue and felt terrible. The management was nowhere to be found, does not return calls and told them to tell us "If we didn't like the price go stay somewhere else" The next morning the staff member who booked us remembered making the error and try to call management to admit she made the mistake and ask him to make it right for us. She felt terrible. Management has still not called us a few days later. The night we checked in there was a staff member who said she was supposed to have gone home 7 1/2 hours prior and kept checking her phone saying her children kept texting her asking when she was going to come home and when they were going to be able to eat. She was on the verge of tears and we were not yelling and being rude. She was easily stressed and kept hearing her face in her hands and saying everybody was mad at her for stuff she didn't do. It was apparent got a couple of other customers were disgruntled over similar and different issues that were poorly handled as well. It is evident these staff are severely and trained. One of them admitted to me the manager only ever trains over the phone and is never on site. Doesn't handle did you rations in the customers favor, almost ever. She said he doesn't care and that is why the stuff make so many mistakes it's because they are untrained. She said unfortunately the mistakes that happened while we were there happen all the time and the staff never knows how to handle them because the manager/owner is never on site. A nice hotel with good amenities. The breakfast was very good and the service from the from desk was great. Our problem was with housekeeping. Our room was not cleaned well between nights and the bathroom not cleaned at all. The hotel was full, so things took a little longer but it was in a good location and the value was fair. Would like to recommend this hotel to others except for the housekeeping issues we encountered. "Nice hotel on the business end of town!" We stayed here on the third floor, while on vacation between two of our major vacation stops (Olympic NP and the Lewis & Clark National Historic Park). It was a bit difficult to find, but we managed. The pool was refreshing. Room was spotless, well maintained, and comfortable. We had a bit of problem with one of the room key cards not working, but the staff immediately reprogrammed both cards and we were set. There is an elevator, and plenty of luggage carts in case you're like us and travel with everything except maybe the kitchen sink. Though there were three places to eat within walking distance, we chose the fast food this time since it was the closest. In the morning, the breakfast included hot omelets, sausage or ham, biscuits & gravy, plain and sweetened yogurt, and the usual sweet rolls-cereals-waffles. We chose to indulge since we had plenty of time in the morning, and it was very good. We would stay here again if in the Aberdeen area. "Relax to the smell of the ocean"
Nice and relaxing weekend away and staying in Aberdeen gave us easy access to both Ocean Shores and Westport. The only drawback was that there was no place to site outside to just take in the views of the Wishkah and Chehalis Rivers. We will be back again in the off season to watch the winter storms coming in off the ocean. "Nice hotel in a good location"
We spent one night at this hotel during our exploration of western Washington. The room and hotel facilities were very nice and in very good condition. The breakfast included many tasty and varied items. There is a nearby Walmart - often needed while traveling. Many different restaurants are within a short drive. We would definitely stay here again, if we were in the area. "Manager has no compasion or concern for customer"
the hotel is average at best and the breakfast area was not clean. after spending 2 nights and after a mistake with the booking system i was charged for 3 rooms an extra night the morning we checked out. Even though the desk clerk identified we had a booking for the night we checked out and she told me dont worry i will take care of that, the cheap and money hungry manager said that policy is 24 hours notice so we will still be charged. Best Western head office will not do anything for us either. Will never stay at this hotel again and i am spreading the message to all my motorcycle brothers and sisters so they are ripped off too. Best Western should be ashamed to have a owner/manager like this one representing their Brand and corporate name. The hotel was fine. We stayed one night as we were just passing through. Check out the restaurant called Rediviva. It was nothing short of amazing good. The staff was great and the owner was there to make sure everything was perfect which it was! If I pass through there Again it would be so I could go back to Rediviva. "Bad attitude of evening staff"
I paid $50 more to stay at this hotel than the other hotels nearby cost, solely because it has a hot tub. When I went down in the evening, the temperature was very low (not much above the pool's temp). I asked the desk person about it, and she said she was aware f the problem, and had left a note for the day staff. Two problems: 1) why not tell me when I check in, and 2) why not DO something about it? She refused to call their service person or the Manager to see if something could be done. She was really snotty about it, too. I thought the location was really good. We were heading into the Olympic National Park and this was a great jumping in spot. You're walking distance to some nice restaurants too. We asked and received a river view room. The room was clean and had nice linens. "It's the ONLY nice hotel in town." It's hard for me to review this hotel, because it's literally the only nice hotel in town, so there isn't a lot of options, but with that being said, here's my like and dislikes of the hotel. I liked the location with a muddy water view and close to the Breakwater and Billy's for dinner or lunch. It's an easy walk to those two restaurants, although you'll need to cross a busy street. I did NOT like the breakfast in the morning. The area was cramped and there was a serious traffic jam trying to get food. Also, the gravy was horrible. "Charged for two nights when I stayed for one. Manager will not return my phone call." When I checked out of the hotel, the computer system was not working. Two employees were on the floor in front of the computer reading troubleshooting instructions. They took my room number and email address and said they would email my receipt. I never received an email. I checked my credit card statement and found that I had been charged $300+ for one night. I have called three times and the manager has chosen not to call me back. I did find out I was charged that much because they had me staying for an extra night. My bad for not getting a hand written receipt, but this is terrible unforgivable to not call back. I worried that it was so close to the train tracks, but never heard the train even though I saw it go by frequently. Indoor pool was warm, however it may have lots of chemicals as it was noticeable in they eyes after swimming a while. "Not the best, not the worst"
We understand the BW is under new ownership/management, so maybe they haven't worked out all the kinks yet. Its location is handy to the main drag. There's a great walking path right outside the hotel which meanders along the river. The pool was pretty busy (there was a Little League team staying here) but we didn't try it. The room was nicely appointed and there were double windows to help block out the noise of the close-by train track. (Yes, it was pretty effective) Some of the front desk staff are pretty knowledgeable and helpful- a couple were clueless. We had issues mostly with housekeeping during our 4 night stay. One day they made the bed and left towels, but forgot to leave washcloths and didn't empty the garbage can. The next day,the towels were there, the trash emptied, but the bread crumbs from our to go food (from day 1) were still there on the floor. Our last day, they forgot to clean the room which we discovered when we returned after 4:30. The breakfast is quite adequate, however they ask the front desk staff to monitor/stock/clean the breakfast area so the customer at the front desk has to wait for staff to finish in the breakfast bar or the breakfast folks have to wait for re-stocking while the clerk checks out guests. Spending a few bucks for designated breakfast help would be well spent. Overall, an average stay. Overall the room was ok. We just happened to be there during a little league baseball event. We left and when we came back the adults were doing shots and drinking in the parking lot. There was a lot of noise upstairs. Very nice room and easy to find location. Good choices of places to eat in the area. Breakfast was a bit on the weak side from other places, but not bad. Room was clean and staff was very friendly and helpful. Helpful and accommodating staff. Small but useful fitness room. The room design creates problems for a family of 4. There should be a sink outside the bathroom to allow for brushing teeth etc when someone is showering or using the bathroom. "Nice motel, pleasant staff, awful location." Nice motel, pleasant staff, but let down by it's location. There is a train track literally a few feet outside the side door, and what should be an interesting and pleasant 'river walk' that goes past the motel is littered with garbage and drunks sleeping off drugs or alcohol. Stayed 2 nights and enjoyed the wonderful, helpful staff. Breakfast was great. This hotel was understaffed and you would have never known unless you had overheard a quite, encouraging conversation with a manager and his staff. The staff pulled together, with a smile on their face, to make each and every guest feel welcome. The hotel itself is spotless and is in a great location. Two star rating due to NO competition. otherwise a one star rating. This rating is due to SAD SAD "FREE BREAKFAST". The town has no restaurants for breakfast except fast food. I suggest FASTING instead of the FREE BREAKFAST. This is a clean and affordable hotel, near everything. I have stayed here many times over the last few years and continue staying here any time I'm in Aberdeen on business. I highly recommend this hotel. The place has been recently redone, so, the rooms themselves are fine. However, note that this hotel is right next to an active railroad line, expect 4-6am trains to come by. The 4(!) pane windows are not sufficient to drown out this noise and will likely wake you up. Also, assume that anything their front desk tells you will change the moment you walk away - and they will shrug and say "sorry". Especially a clerk named Sharon - she will promise one thing, do the opposite, then just shrug and say "sorry, can't do anything about it now". If you're staying in Aberdeen, stay here. Great hotel. Friendly and knowledgeable staff. Adjacent to a shopping center. River walking path right next to the hotel. 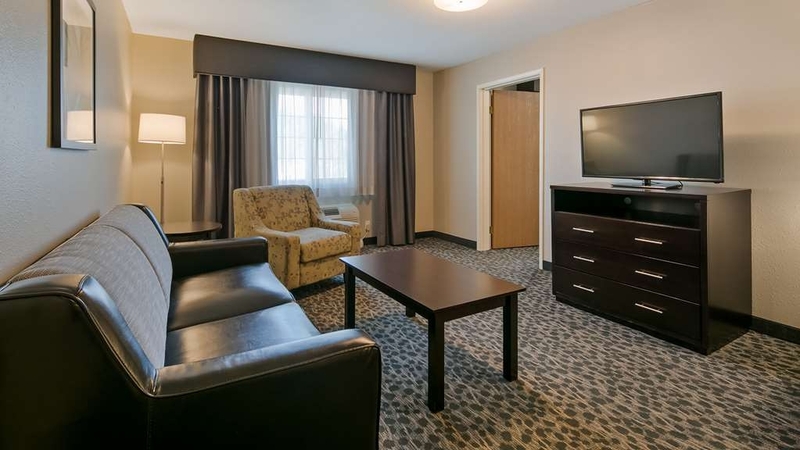 Good size rooms with comfortable beds, big flat screen TV with lots of channels. Very clean. I highly recommend this hotel. "Just ok with nice beds"
A place to crash with no charm and a bit of scary. Convenient to some surrounding amenities. Pool had great hours BUT water was dirty, murky. Smelly surrounding area, scenery depressing. Overpriced for the simplicity (lack of beauty) Room was comfortable, bed was nice, a/c worked fine. "Spotlessly clean property, Friendly helpful Staff, Reasonably priced." We had a wonderful stay at this hotel. The staff were fast, friendly, and extremely helpful. The breakfast was huge(although the area around it was cramped/busy weekend). FAR BEYOND OUR EXPECTATIONS! Our room was nice and quiet even though the property was likely full due to multiple events in the area taking place. Pool towels were kept stocked. Amazingly responsive staff, just can't get over how wonderful they all were. We will stay there exclusively for all of our future trips to the area. We were just passing through and spending the night, arrived about 11PM and place was slammed, I think we got the last parking spot. Asked for and got upper floor, single elevator was slow, room was average. They have indoor pool and it was heavily used. Didn't hear much noise overnight and the bed was great. Breakfast was average, kudos to hostess who single handily kept food stocked with huge crowd. They had a few warm items, eggs sausage, etc. My only compliant really was the price $138? "only place to stay in Aberdeen, WA"
clean and comfortable. walking distance to shopping and restaurants- don't walk alone here, however. As a female business traveler, this is the only place I will stay and feel safe. Haven't used any of the amenities yet. Rooms very clean, one of the newer hotels in Aberdeen, WA, staff very friendly. Location was easy, plenty of parking. Beds comfortable and good internet service. Breakfast provided, pool available for guests. Price is reasonable. "Decent place to stay "
This place used to be the Guest House Inn and it was bad. It went through a remodel last year and is now a Best Western Plus. On BW standards it's average. Lobby is nice and rooms are clean. Bed was very comfy. Rooms can be loud if your windows are open due to road traffic and trains, but they do have double windows. The staff at the front desk was bad. Lady helping our group didn't smile once. She hit all the required BW statements as one usually hears, but maintained a solemn attitude the whole time. Appears she hates her job. Breakfast was so-so. Below average for BW's. I'm not a fan but if in Aberdeen your choices are limited. I'd prefer to stay at a BW in Ocean Shores or Olympia. Great room, courteous staff, extremely clean and loved the new decor colors. Would stay there again...close to good restaurants. Thought the room rates were a little high for Aberdeen. Appreciated the microwave and fridge and the cleanliness of the bathroom. Also linens were white/white. Loved that! "Best place by far to stay in Aberdeen"
This is the nicest place to stay in Aberdeen. It is near Walmart and Starbucks. There is a train that rolls by early in the morning for a not so welcome wake up call. The hot tub was out of order which for this trip was not a huge issue to us but I did hear other guests grumbling about it. Breakfast was satisfactory. Overall, it fulfilled our wants and needs. Stayed here for three nights over Memorial Day while in the area for a wedding. The hotel is very conveniently located, right next to shopping and the river. Room was very clean and bed was comfortable. I had some reservations about staying here based on the reviews, but I'm happy to say I have very few complaints. The few negatives, the hotel is right next to the train tracks so we did get woken up by the train - but it was a total thrill to watch them go by for my 3 year old who loves trains. The breakfast was totally mobbed and the area a complete mess - but it was over a holiday weekend. Seemed like the staff had a bit of trouble keeping up, but they tried. Our smoke detector alarm kept going off from the steam from our shower - that was ANNOYING. Used the pool and it was nice, though the hot tub was out of commission (no biggie for me, but worth noting.) All in all, very happy with our stay. "Super Nice Hotel in Aberdeen, WA!" The best hotel to stay in while visiting Aberdeen, WA! 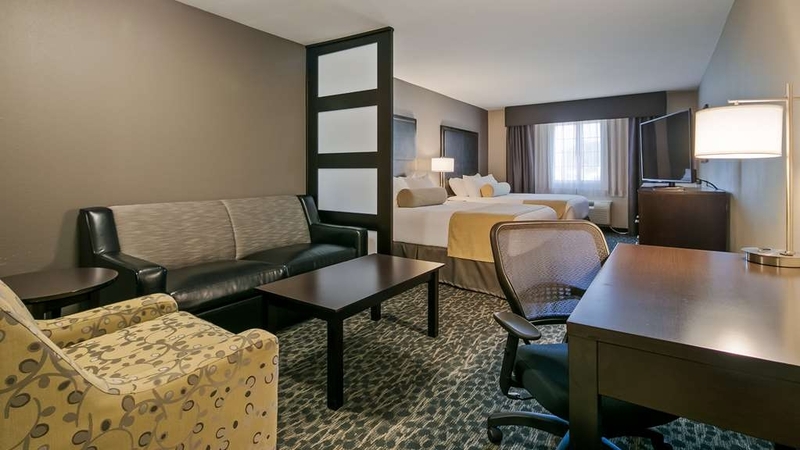 Recently renovated rooms, clean, quiet, attentive staff, and close to food and shopping. This is the second time I have stayed here and will be back. How relieved I was to pull into Aberdeen and find an available room at the BW. The room was ready, pet friendly for my BFF rottie and so welcome to weary travelers. Well priced and right along the river so we could walk the trails and enjoy the shorebirds and ducks in the morning and evening. The staff was super friendly and accommodating to our needs and the housekeeping staff even threw the ball a time or two for my pup! Nice! "Really Nice Suite at Reasonable Price"
I've stayed a many Best Western's, but this was my first experience at a "Plus". Well, it really is "Plus"! It was a really nice suite, which was unexpected; I was assuming the standard room (always nice, btw). I have stayed here before, but in times past, there was some remodeling going on. This current stay was wonderful. The bed's were comfy, the staff were great, and the breakfast being served was at it's best. Keep up the good work. We will be coming back next year. "Just one night here at the Best Western"
Very economical. Very clean. Comfortable beds. Very quiet. Terrible breakfast. Fine for an overnight en route to somewhere else. First time staying at a Best Western and based on this night, would stay in one again. My wife and I stayed at this location April 29, 2017. There was no hair dryer in our room so my wife went to the front desk to get one. The girl at the desk said there was one under the sink, my wife told her there was not one there so the girl gave her one. About a minute later, there was a knock at out room door, it was same girl who was at the desk insisting to inspect the bathroom for a dryer. Before we even knew what was happening so was in the bathroom looking for the dryer. I was in the bathroom with only a towel on and my wife is just a shirt. The girl had a phone with her and told the person on the phone that there was no dryer in the room. This situation should have been handled such more professionally. We don't typically stay in motels but motels are the only option in Aberdeen. This motel was a pleasant surprise. Clean room, plenty of power outlets in the room for our families devices, including USB ports. I was in Aberdeen for work. I scope out the websites of the local hotels and found this one to be the best combination of promising photographs and decent reviews. I was pleasantly surprised by what I found. The room was clean and recently renovated. Honestly, it was better than the last few major higher-end big city hotels I have stayed in. The only complaint was that a picture was hung a little crooked. That's it. Front desk staff was courteous and helpful. Breakfast was perfectly passable. Good value. The next time I'm in Aberdeen, I'll try here first. "Really impressive personal reintroduction to the Best Western chain"
I had not stayed at a Best Western since I was a kid, and that was decades ago. The brand had an unfavorable reputation. But I had heard through the grapevine that they have dramatically up-leveled their product in recent years so I figured I'd give them a try. And I would have to say I was very, very impressed. This property has a modern, clean exterior. Luggage carts greet arriving guests, providing an element of convenience not always found. The room was clean and comfortable, with modern and fresh furnishings. Internet was free and easy to get online quickly (had to call the front desk for the access code, only to be told it was written on my key card holder, something they should mention at check in). In-room microwave and refrigerator was an unexpected bonus. I did not have a chance to use either, but it had a pool and a small fitness center. Nobody will confuse the fitness center for Gold's Gym, but it was very passable by the standards of lower/ mid tier hotel brands. The complimentary breakfast was fairly decent. Not gourmet, but certainly passable. A bit of a backup built up for the self-serve waffle maker, so I decided to forego the waffle which maybe was a good thing. On weekend mornings, breakfast does not start until 7 AM, I would have preferred 6 AM. A lot of guests staying here are likely there for recreational purposes and may very well be looking to get an early start. I appreciate that the hotel has a pet-friendly policy. We had a "pet room" but it was very clean. There are ample places outside for pets to do their business. The only glitch is that nobody was staffing the desk when I wanted to check out (which was about 8 AM, a normal check out time), and it took a couple of minutes for someone to finally come . . . and then due to some computer glitch they had had us having been there for 2 nights instead of just 1, and the front desk clerk was unable to correct the error on the spot . . they'd "take care of it" and email me the final bill later, which does not inspire confidence (and then the email never came until I called two days later to request it). In short, despite the check out glitch, I was very impressed and would not hesitate to stay again should my travels bring me to Aberdeen. "Best Western Aberdeeb along the way to the Olympic Peninsula"
Best Western Aberdeen WA is a New Facility with all the amenities one may need. Beautiful location on the river, pleasing spacious rooms with breakfast included. Nicely decorated, comfortable beds, nice linen and fluffy towels with fridge, microwave, and in room coffee. Hotel is modern conservative decor. The large Hotel property is easy to visually locate and access, with ample convenient parking. We had to wait for the desk clerk to finish her personal phone call before Dallas could check us and another couple in. I do believe they don't train these people or they just don't care. Most the staff are 20+ something and do not have a service mentality. At breakfast it was a disaster! There was a mob of people and Dallas was taking care of the foods. Everything was depleted or dirty. The floor and the counter were a mess. One guest cleaned the waffle maker and got it operational again. Again the staff was inadequate. The food was being brought from an area that was also storing cleaning stuff and carts. I couldn't see around to where the food was being prepped but I can imagine it was in shambles too. The room was average. They were sold out except for an overpriced king suite. The bed was good. The shower and bathroom were clean and functioned well. At check in Dallas had put my info into the computer wrong and my credit card sent me an alert. I got that corrected but then my points didn't show because of the error. We had to ask for our free bottle of water as we left. This place is OK but the staff just doesn't have their act together. I wonder what the ph of the swimming pool was? "What a Lucky Find! Needs More Signage!!" What a lucky find when we found this hotel! We looked at others in the area but we're not very pleased with any of them. After driving around we came across the Best Western Plus that had just been newly renovated. Very comfy beds! Very nice pool that wasn't ice cold and the hot tub was quite large. The breakfast was a full hot breakfast. We would certainly not hesitate to stay here again. Decent price, as well. Staff was great, room was immaculate. The only complaint is there was a lot of chlorine in the pool and it burned my eyes a little. Honestly the was the only thing bad about the place. Staff was great and helpful. We apologize for the issues you had with the pool, we had installed a new chlorinator and the settings were still be perfected. Thank you for the kind comments. I stayed here almost 1 year ago as they were finishing the remodel. The staff was still friendly, now a full Best Western Plus with great rooms and rewards benefits. Hotel was clean and quiet. Breakfast was a bit sparse, but okay for a business Traveller just needing a quick bite in the morning. New indoor pool and hot tub looked inviting and would be more than sufficient for a short family stay. Plenty of fast food options within walking distance. Thank you for being a repeat customer and please do come see us again. "The Best - Best Western"
Where were from they're aren't very many Best Westerns left or very run down. Was a quick business trip but would come back again if I'm in the area. Will tell corporate that it was an excellent spot and hopefully they will keep using you. Would recommend to anyone. We greatly appreciate your kind comments and thank you for recommending us. Please do visit us again. 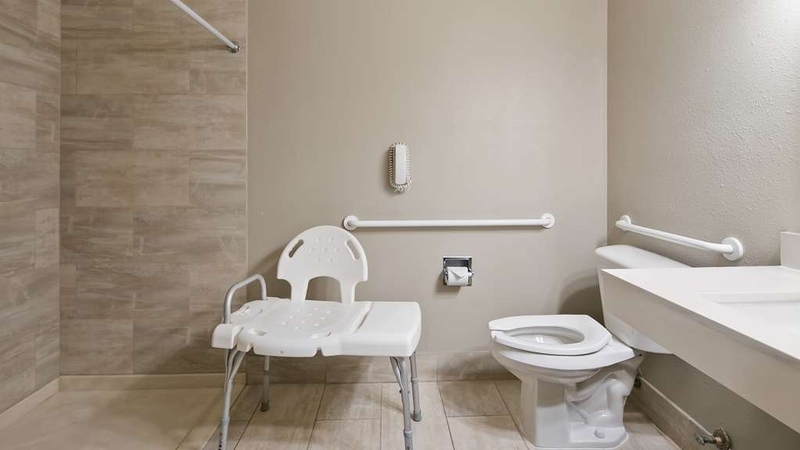 "Friendly and walking distance to Shops"
We booked online with only a handicap king room available. Upon check-in, the staff thought that was weird and asked if we had any discounts...told him we had AAA, AARP, Senior, BW Perks, etc. He then upgraded us to a mini-suite for no extra cost because we definitely did not need a handicap room! The lobby was very clean and muted decor. Our room was wonderful with a couch and stuffed chair. Could not have asked for a more welcoming staff or nicer room. AND it was quiet, even though it was on the highway side. We are happy to have met your expectations and are delighted to hear your stay was great. Thank you for staying with us. "Only place to stay in Aberdeen"
Had a few choices on lodging, but after talking with some locals, we chose the Best Western for safety. The front desk clerk Meela was outstandingly friendly and helpful. Room was clean and fine for us. We take pride in making sure our guests always feel safe and secure. Thank you for staying with us. I didn't see a single problem with our stay. It was clean and a great stay. We will definitely be staying there again. Very happy with that we chose this hotel. We only stayed there for 1 night but the staff was very nice and helpful. The lobby was beautiful and the pool looked very clean. Great location on waterfront. Close to a couple good restaurants. Friendly check-in. Very nice room; spacious with comfortable furnishings. Lovely pillows and great shower. Good fitness room and pool/ hot tub area. We are a couple in our 70's and have travel all over the US pretty well. We found ourselves in Aberdeen last night and checked into the Best Western Plus there. The bed( king size ) was awesome, comfortable and the pillows were great. Best sleep ever in a hotel. The fridge, microwave and coffee maker were a wonderful added bonus. The gal that checked us in, when asked suggested quaint little seafood restaurant right across the bridge, the food was awesome, she called it right. In the morning we had the continental breakfast, which we usually skip at hotels because they are terrible, but here we had choice of cereals, scrambled egg, bacon and sausage, biscuits and gravy, Danish, muffins, toast and juices as well as coffee and tea. We will definitely stay there again when in the area. We are very happy to hear that your stay was beyond exceptional. We strive to have this same response from all of our guest so again we thank you for the awesome review. Please do visit us again. "Passing through on my way to the Olympic Peninsula"
Loved the service,cleanliness and convenience of location. Only problem we had was the hotel is located in close proximity to the train tracks. Not a big problem except that the train whistle is constant whenever they pass through town. Disrupted sleep for one in my family. We thank you for the honest review and yes sometimes the train can be an issue. 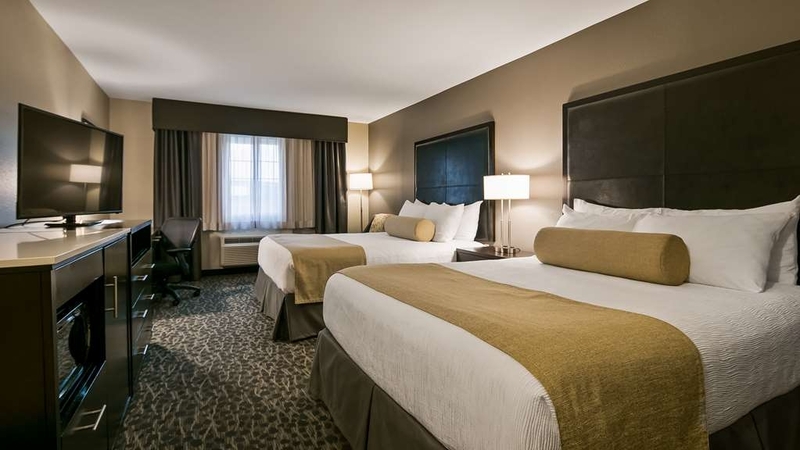 "Best Western Aberdeen WA Great stay!" For a small town hotel, Best Western could definitely compete with much larger hotel chains. Beautiful décor, rooms were kept immaculate, hot continental breakfast which I appreciated, and the staff went out of their way to be helpful! Thank you for the review and have worked hard to make this the best hotel in town. Please do visit us again. Stay was average at this motel. Breakfast was inadequate Very few choices. If you like dry cereal, and waffles, that is pretty much all you get. They did have biscuits and gravy, but the gravy was like water with no flavor. Put this on your biscuits and they turned to mush. If I was them, I would be VERY embarrassed. I have been happy with the other Best Westerns, but this one does not live up to their standards! We apologies for not meeting your expectations about the breakfast. However we have completely redone our breakfast items and now offer a wide variety of options that also include gluten free choices. Please visit us again. We loved staying here. The staff is friendly and very helpful. My husband said the pool was perfect. The breakfast is pretty standard but nice...We also have to say they have the most comfortable beds ever. Thank you for the great review, we have since significantly upgraded our breakfast so please visit us again. "Quality, comfortable, clean and spacious." Best Western Plus have become our preferred hotel on this trip. The rooms are clean, spacious, comfortable, and quiet. The breakfast are "hotel typical" with scrambled eggs, sausage, etc. The breakfast room was clean with plenty of tables. The staff was courteous and professional. We'd recommend this hotel to all. I was staying with my family on Lake Quinault and needed strong wifi and a place to work until midnight. I drove to this hotel for the evening (about an hour from where I was) and it worked out perfectly. My expectations were low because Aberdeen leaves a lot to be desired but this hotel was perfect for my needs. The room was large, had a separate couch area, the air conditioning was quiet and worked well, and everything was clean. I read on a few other reviews that the hotel was just renovated and I'd believe it--things felt new and comfortable. I paid $120 or so for the night at the last minute and it didn't feel like I was overpaying. (it was a Saturday night) Check-in was friendly and fairly fast and the included breakfast was exactly what you'd expect from about 85% of free included breakfasts. (fruit choice, dry cereal, that waffle mix machine, etc.) Parking was ample in the lot right in front of the hotel. I didn't hear a lot of noise beyond the train tracks that run literally right next to the hotel. I was happy to look outside and see the river and train bridge and see the train as it wasn't too late in the evening and I was alone, though I can see how something like that might affect families with children. There were no train whistles or anything, though. Renovation has improved the property but rate is far from being justified. Breakfast is in need of improvement. For the rate price, they should offer a personal chef! Need to implement a corporate/business rate to attract more business. This hotel exceeded all expectations. If all Best Western Plus hotels are like this one, sign me up as a regular customer. The room was beautiful and spacious, and very comfortable (frankly, it reminded me of a high end Marriott - no kidding). The included breakfast was very good - eggs, sausage, waffles, etc, all in a nice breakfast area where staff made sure all items were plentiful. Housekeeping staff were uniformed and very pleasant. A super hotel at a great cost. Wonderful hotel with a great staff, nice location in town and very accessible for parking. Newly renovated and very comfortable rooms, lobby and open space. Great place to stay and we will visit here again soon for our faamily reunions. 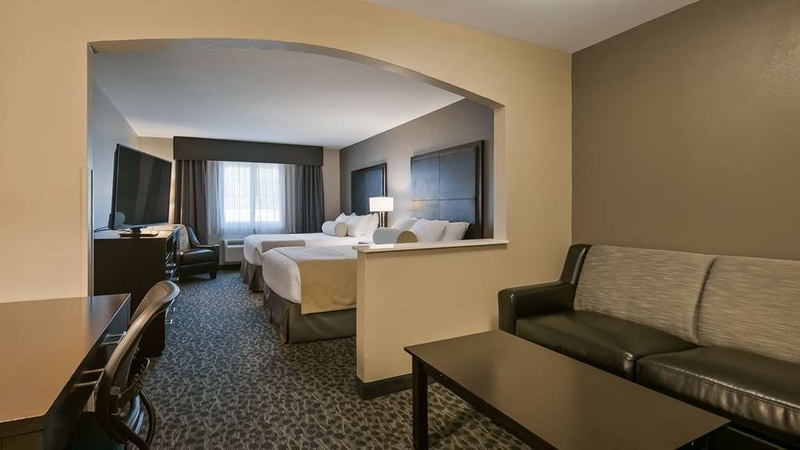 "Very well renovated hotel with a great staff"
Best Western has done a great job improving the appearance and quality of this hotel. The breakfast includes scrambled eggs, sausage, biscuits and gravy, cereal, breads, etc. well done. The staff is very helpful and accommodating. This is the best hotel in the Aberdeen area. "Remodel of hotel is a good start." I see that the hotel is investing in the property which is nice. 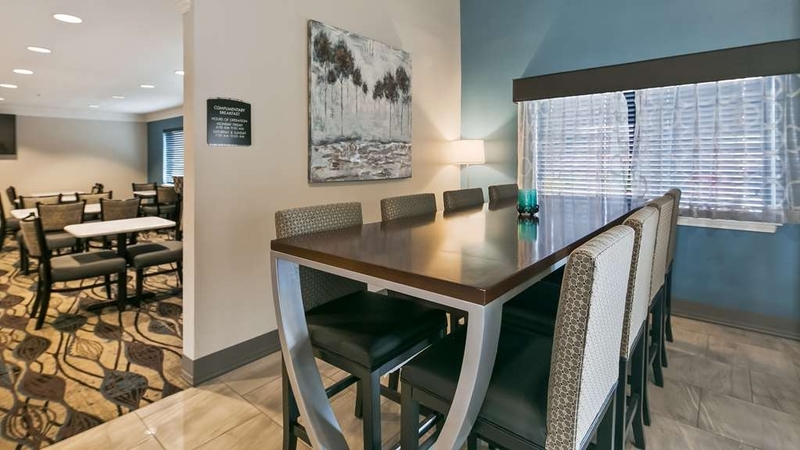 There are a few other items, such as additional healthy options at breakfast, and training front desk staff to run more efficiently when there are multiple guests waiting for a room. Once they get that figured out the hotel rating will definitely go up. We arrived later than expected but the welcome was warm and friendly. Our room was large and well appointed. It was very quiet, well insulated from traffic and other noises. Breakfast was ok. A good place to break a journey. The ladies at the front desk are very accommodating. The beds were comfortable. The pool water was a touch cloudy, but I did I noticed there was a tech there when we were checking out maybe he got it corrected. We had a bit of a quick stay here, but wished we stayed one more night! It was a very pleasant hotel and we loved our room - two sofa beds and a King bed! Price was reasonable, as well. We will definitely be coming back here the next time we pass through Aberdeen! They have good staff but dirty pool and hot tub! Not good and breakfast ends to early! We do like to stay there but they should have more discounts available to people who stay alot or maybe we choose to go somewhere else..
"Very pleasant after a long day of driving"
The two ladies at the counter were very professional and helpful. The rooms had a modern design and beds were nice and confortable. Everything appeared to clean and well kept. Definitely would stay there again. Photos online are exactly the way the rooms are. Very clean, bed was the best and super comfy. Service was good, professional front staff. No noise bleeding over from other rooms, though hotel was packed. Was a great experience! Thought price was a bit high, but it was summer - so nothing to complain about. I would definitely stay here again and recommend. "The Room was Great, but the Hot Tub? Not so Much..."
I think the rooms are very nice, clean, furnished comfortably and in fabulous condition. The bed is very comfortable! It's clear they have a good thing going with their cleaning staff because it is done well. If it weren't for the hot tub, I'd have given them a 4. The first night I stepped into the hot tub and felt grit under my feet but didn't think a lot about it. The water seemed dark and it was hard to find the steps. The second night I went to put on my swimsuit and it smelled rank, that was odd. I was the only one in the tub so I went to the far side and there was dirt on the floor and seats. I wonder how often it is cleaned, and is that why it seems so dark, and my suit smelled badly? I'm not sure, but I got out and hand washed my suit. Really, I like this place a lot, the rooms are great, but attention is needed at the pool. Decent place with very nice rooms. Could use a complete overhaul of the public areas along with an upgrade in the food served at breakfast---Scrambled Eggs were Very Good and not our of a Box. Room was very nice with a Great Bed for sleeping. The reception was pleasant and professional. The room was great! The breakfast was very good - and staff were constantly replenishing the food items. One of the nicest hotels we stayed in our way to San Francisco. Would definitely stay again. They have renovated this hotel and changed to BW. The renovations were done well and the rooms look great. The staff seem very nice and helpful. I recommend this hotel and it's really the best choice in the area. In walking distance to several restaurants. "The only game in town...but don't expect much." This BW looks like it has been recently remodeled and is right next to the river. The grounds surrounding the hotel are quite nice. The rooms are pretty much what you would expect furnishings-wise. There is a fridge and microwave along with plenty if convenient outlets for your computer and phones to charge. 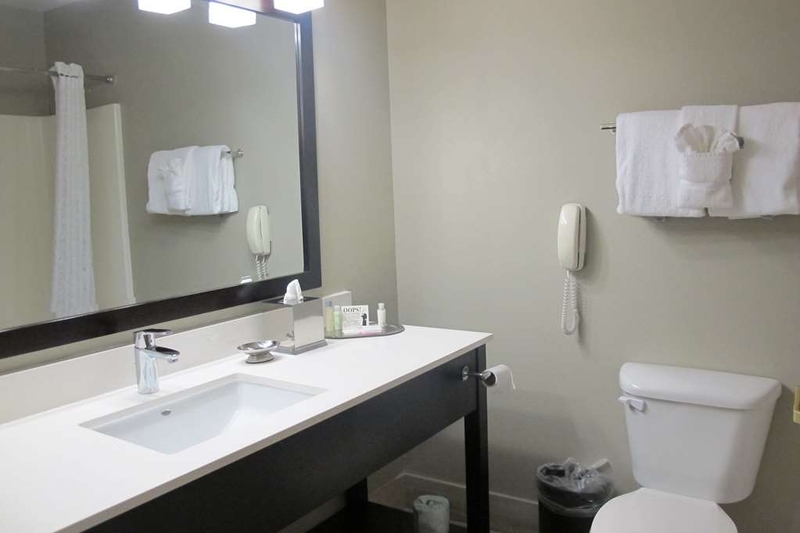 Oh and there are plenty of fluffy and absorbent towels for your convenience, so the room overall is better than one should expect from a Best Western. There is an indoor pool and workout room which has three cardio machines and a weightlifting machine. So physically, this place is about as good as it gets in Aberdeen. The problem is clearly ownership. Why? Let me give you some examples: 1) There is a guy that attends to the breakfast setup in the mornings whose uniform is a white tee shirt. Yes, a tee shirt others would say is an undershirt...and always untucked to match the sweat pants he wears. So he looks like the many hobos that live near the hotel. He seems to think the gloves he wears is for HIS protection as he uses his hands to refill the food (try using tongs) then he goes and empties the garbage while keeping those same gloves on, I guess in case he has to refill any of the very same items served every single day. So unsanitary. Note to owner: have some standards and get your employees food servers certification. 2) For a long time the workout room was out of water and I was told by many that they had told the owner but he said something like "too many people just go in there to just get water and not workout" which means he is cheap and doesn't care about guests, those that workout or not. There is no sanitary wipes there, which should be a law as sweaty people use the machines. And for a week the heat was on and he did nothing about it so working out in 77 degree heat was not fun. I repeatedly asked about it and was told night after night that they informed the owner but apparently the maintenance person was out sick and the owner had no clue how yo fix it. Nice touch. There is one bright star that genuinely cares about the guests (as opposed to the penny pinching, no standards owner) and that is Amanda. She has a delightful personality and is helpful and efficient. Too bad the employees aren't all like her, as she is outstanding. So stay here if you must, and if you don't have high expectations, you will be fine. Hopefully you will find Amanda to help you as the owner simply does not care about you (just your money). A wonderful place to stay. Close to rivers and Olympic National Park. This was our first trip to the Washington coast, and Best Western was a great start to the experience. Hotel appeared new, and obviously well maintained. Breakfast was your typical motel breakfast but they were prepared for the number of visitors and did not run out of food. 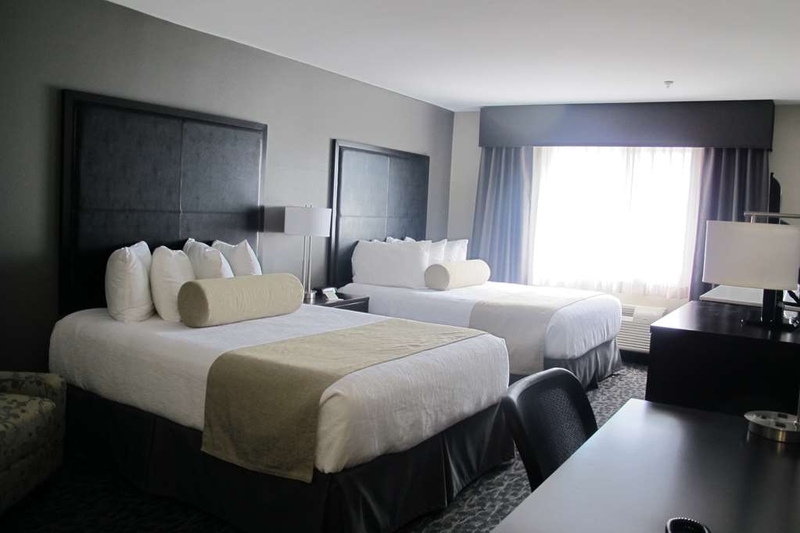 This hotel is conveniently located near downtown Aberdeen. We attended a concern at the D&R. The room and accommodations were great. Clean and comfy bed. The coffee at the breakfast bar was top notch coffee for a Seattlelite. Felt like a five star hotel. We will definitely stay there again. Driving from Seattle to Frisco we found this Best Western in Aberdeen, WA. The town itself is a little rough around the edges but hidden back off the road is one of the very best places that we had stayed in a long time. Very to date, beautiful interior, and exceptionally clean. For the most part it has all the good stuff...workout room, pool, laundry, and free breakfast. With all that , it is still priced in the affordable range. "Last minute save in a cozy gray town"
This is such a wonderful last minute save for us! We were traveling from Seattle to visit the Olympic National park then drove the scenic route to Oregon. I would have never considered staying at Best Western if we weren't desperate. Finding available accommodations in Forks is challenging already, plus some places didn't even look "safe". Our stay here was beyond comfortable: after long day of being on the road and hiking, we were very relaxed and comfortable here. The service is fast and friendly. The heated pool and hot jacuzzi were an added bonus for our tired body. The accommodations were incredible. Room and bathroom are very new, and updated. Sheets and cover were new and soft. The bed is very comfortable! Highly recommend staying here if you're passing through from washingtonn to Oregon on your pacific coast highway 101 drive! I will now consider Best Western Plus for all my future hotel stays. The hotel was in excellent condition, the staff was friendly and helpful, and our room was spacious and overlooked a small river. Breakfast was included in the cost and was more than ample. We enjoyed our stay and will return to the hotel when we are in the area. 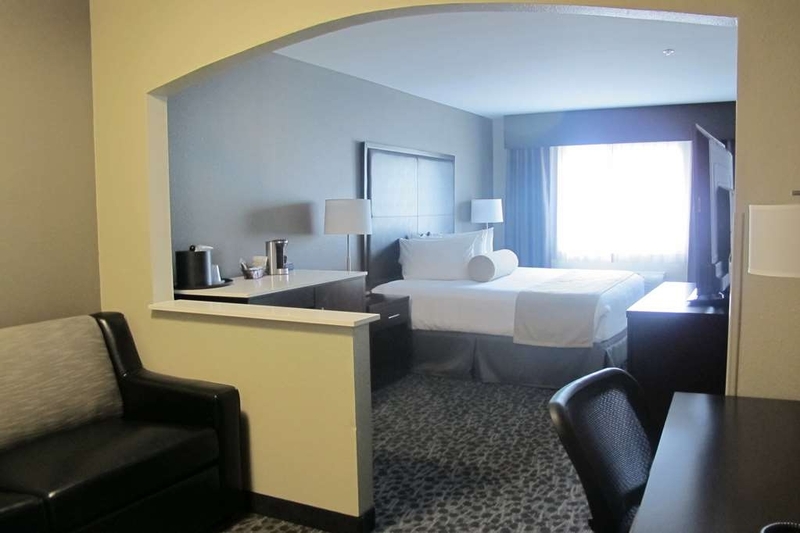 "Aberdeen, WA Best Western Plus Business Travel"
Excellent facility. Clean nice rooms. Excellent staff and proximity to the areas I needed to go. The breakfast bar was inclusive of hot foods, including eggs, sausage, gravy, toast, waffles and oatmeal. Coffee was available throughout the day. The rooms had USB connection for charging my phone and tablet/. There were accessible plug-ins throughout the room for charging other electronic items. The large flat-screen TV was nice. The bed was very comfortable and the housekeeping staff were excellent! The hotel is tucked away on the main road, with a railroad running past one side. However, the room was very quiet even though the hotel was packed. The room was a good size (2 queen beds), clean and comfortable -- no issues at all. The free breakfast was not great compared to other BW stays in the northwest. What a fantastic place. Clean, a beautiful and thoughtful remodel. Very comfortable, great pool and fitness room. The owner who was responsible for this remodel was very kind and genuine. We highly recommend this wonderful hotel. Great value and convenient location. Excellent in every way! I booked this as the Aberdeen hotel. I had no idea it was a Best Western. We just wanted a place to sleep that was clean. We got more than that. The hotel seems to have been recently remodeled. Fresh paint, new furnishings etc. it was a pleasant surprise . Previous reviews said there were issues with the hot water. We did find the hot water to be temperamental, but that was the only thing we raised an eyebrow at. Everything else was perfect. For the price you cannot go wrong. There is a Walmart adjacent if you need groceries or snacks. The hotel was ok as was the staff. The food was bland at the breakfast there wasn't anything special on the menu the eggs were very bland. The reception on the television was not very good it was fuzzy and not a very good selection of channels. This is a newly renovated hotel and they have done an awesome job. We looked at other places to stay in Aberdeen but most had some pretty sketch reviews. We highly recommend this and would definitely stay here again if we are in the area. Our room had a jetted tub and a great king size bed. Since everything is new, there isn't much to complain about! "An unexpected treat in Aberdeen"
We spent the 4th of July in Aberdeen visiting the annual Splash Festival. The hotel has recently been totally renovated. And they did a great job in the renovation. It looks like a brand new hotel. Rooms were nicely decorated, very quiet (even the air conditioning), and super clean. The staff was extremely friendly. The free breakfast wasn't superb, but not bad either. The hotel has a path where you can walk along the river just a few steps away. And the train come right by your window - but that only happened once during the day and it was kind of fun watching it. It was a LONG train. All in all, this was a super experience! I'd stay here again in a second. "Great Surprise - modern quality motel." The hotel is not exactly located in an ideal position, situated between a couple of bridges, opposite a car dealership, and in front of some rail tracks and a canal. Basically you are assaulted from all directions by vehicles, trains and boats, however do not let that put you off this excellent little motel. I understand that the hotel has been undergoing renovations for quite some time prior to our stay, and although still not completed they have come a long way. At the time of our stay parts of the car park were being dug up and tarmac laid, and the swimming pool was having work done, but the lobby and breakfast area was brand new and fresh and modern. The corridors were likewise clean and fresh. Our rooms were ultra modern, with cool grays, blacks and crisp whites. The bed seemed new , as did all the linen , towels and pillows. Dark brown modern leather sofa, big flat screen TV and modern new bathroom more fitting in a up class hotel in Seattle. Despite all the noise from outside, the hotel have recognised the potential issue and have outer double glazing on the window and then another inner pane of double glazing, which results in 99% of the noise being completely deleted, the only sound that penetrated our room was the freight train blowing is horn on the bridge right by our hotel window and even then that was muffled - well done to the designers for recognising this issue. Breakfast was pretty good with a fair choice. The hotel is a really good place to stay in this area and I felt it offered excellent value and a great nights sleep. "This hotel is okay. Best Western seems to have the market in this area." We stayed here only because we couldn't find anything else at the time. It is an average hotel which I find most Best Westerns to be. They seem to have cornered the market in the pacific northwest because they, Best Western, are in every town. The room was okay; clean and comfortable. I think it is a bit pricey for what you get. The front desk staff was accommodating to a point but not overly helpful or friendly. It's a place to stay is about all I can say for this hotel. "Nice Hotel in a Questionable Area"
The hotel has recently changed from Hotel Aberdeen to a Best Western. The room was really clean the hotel was updated and really nice. The bed was so comfortable we slept in (something we never do). The bad side of this hotel is that there are panhandlers walking around the parking lot -- and just a block away from an area of town that is run down and sketchy with very seedy people walking around. "Pricey, but comfortable - BUT ..."
"Best hotel in area - newly renovated"
"TRIP TO OLYMPIA NATIONAL PARK"
This hotel was just remodeled. It looks like a new hotel inside. The rooms were nice and the bed was very comfortable. Our room has a view of the canal. Breakfast has (make your own waffles) that was very nice plus eggs and sausage, etc. We drove from Portland to Olympia National Park and we were able to stay the night at Best Western Plus as resting point. "Brand new Best Western Plus. Excellent accommodations." 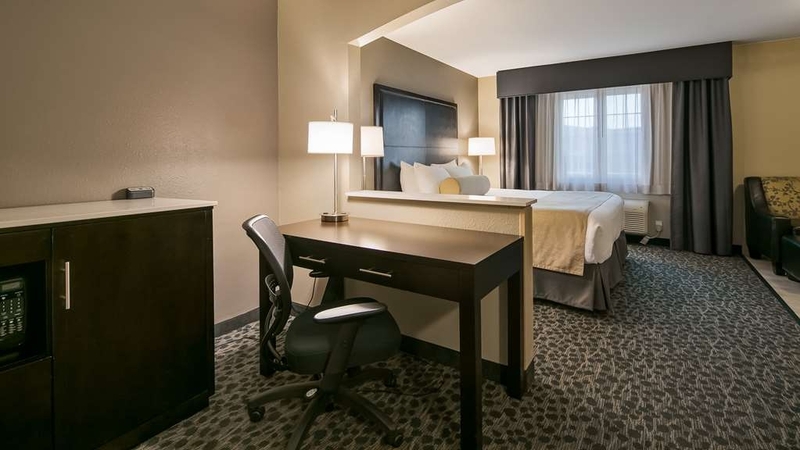 Everything is new in this Best Western after a total remodel. Stayed here on June 13. 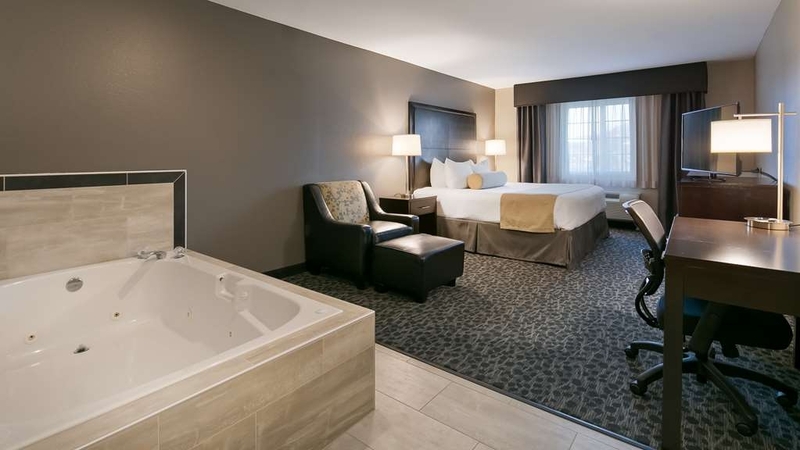 Big rooms, nice pool and hot tub, good hot breakfast, coffee always available, USA Today, microwave and fridge and coffee maker in room, on the river location offers nice walk, very nice modern decor and furniture, great beds, very quiet, 12:00 checkout. Breakfast is only until 9:00 AM. This is an excellent new addition to the Aberdeen lodging scene which was in dire need of decent accommodations. This hotel has been totally redeveloped and will soon become a best western plus. The rooms have been refurbished to a very high standard and all are mini suites. Each suite has a kitchen area (fridge, 2 ring hob, microwave, sink, table and 2 chairs plus some pots, pans andplates) a lounge with sette, armchair, coffee table , desk, chair and flat screen tv. The separate bed room also has a flat screen tv. Aircon in both rooms is good. The bed is very comfortable. 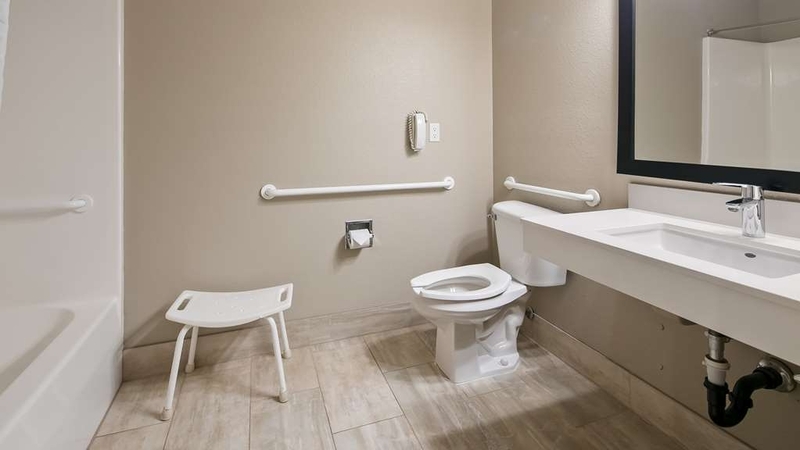 The downside is the bath which has the grab rail is fitted at the wrong end which makes it impossible for any one with any form of mobility issues to use it. The breakfast - the plates and bowls were all very cheap and small and totally out of keeping with the standard of the rest of the hotel. The variety of food on offer also needs to be improved. First of all, it is not the Aberdeen Hotel. Has been bought out by Best Western. Upon arrival, couldn't park under the canopy because of ladders and saws. We were told at check in they would be remodeling until the 9th of June. Cludder and boxes everywhere. Once in our room we found it to be very spacious and clean. Lost signal on TV while watching,. 20 minutes it was off. Called the front desk, and clerk came down and solved the problem. Went to the fitness room to work out it was disastrous. Beautiful equipment, but breathed in the dust for 40 minutes. Breakfast is from 6am to 9am sharp. If you go at 9:01 you miss out. The second day of our stay, we had an encounter with ant's. Crawling on the desk, and TV table. Staff were OK. Other than ant's in our room it was nice. But I will not stay here again. Pool and spa out of order, as was under going a make over as well. Internet was in and out in the business center. Soon to be a Best Western Plus. Complete remodel of the interior to be completed in a couple weeks. Still needs some finish work, but the rooms are nice and there is a great little Seafood and Chowder house called Breakwater right across the bridge with Walmart and fast food places within walking distance. The check-in staff was very pleasant, despite being busy with call ins. The room was old but very large. The beds were OK, and the bathroom while small had good water pressure. I gave this place three stars but I can see where some people would err on the lower side. The best part about my staff was the local attractions, especially during the fourth of July weekend.